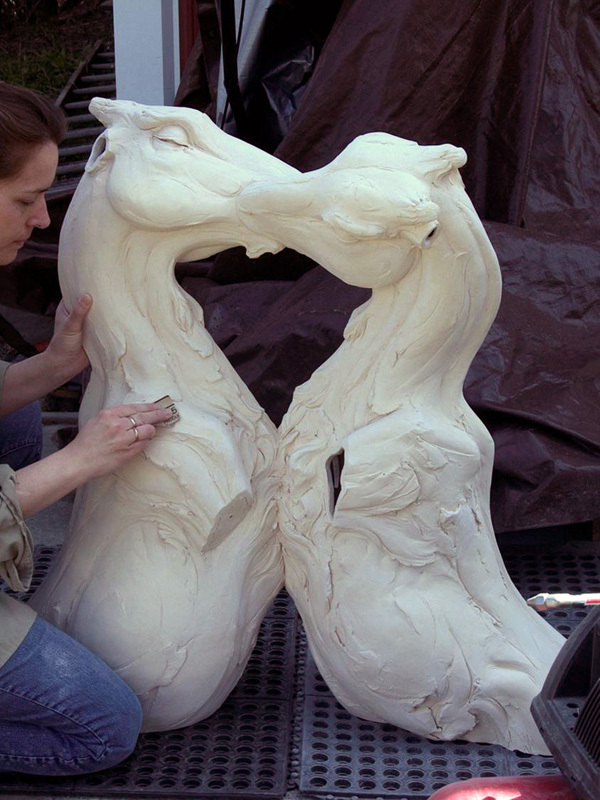 The larger pieces I create take 4 to 9 months to complete. 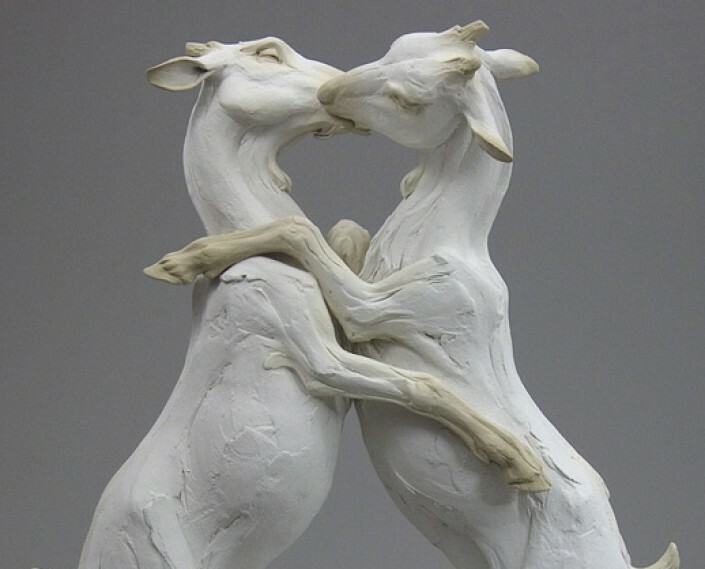 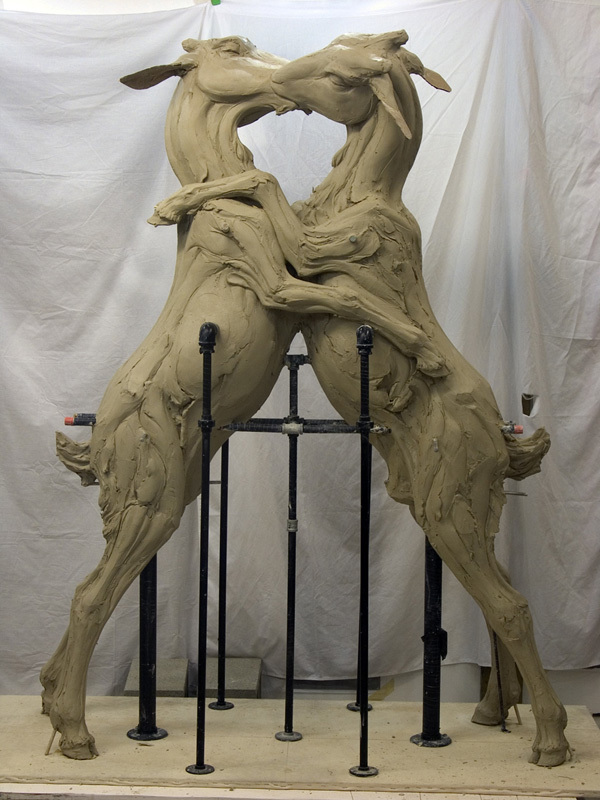 Typically, I develop a body of work over a 2 year period, consisting of 6-8 figures that will be shown together. 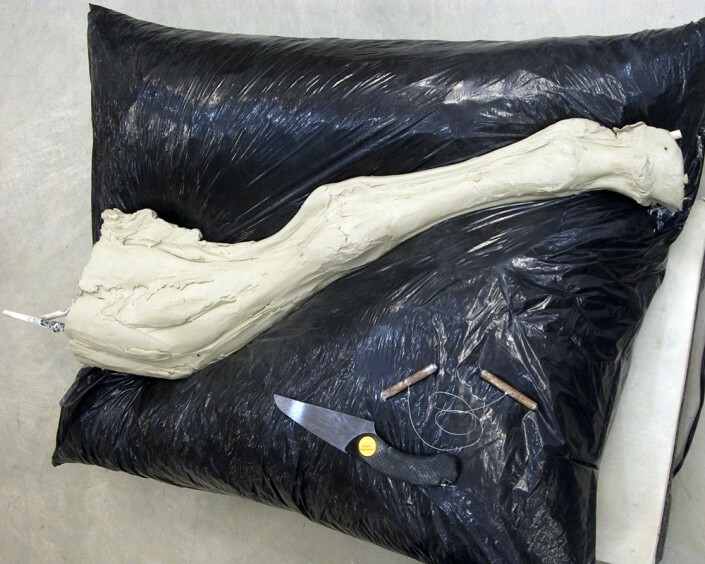 This piece, “Rush..” was the central figure of the installation, “On Tender Hooks”, exhibited in 2009 at the Claire Oliver Gallery in Chelsea, New York. 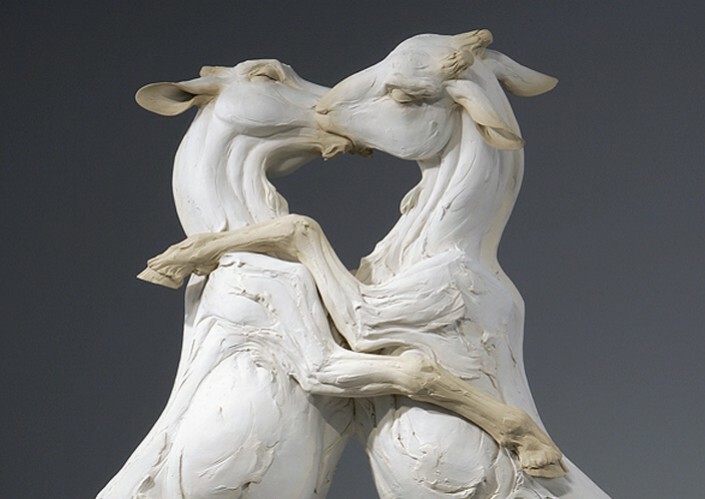 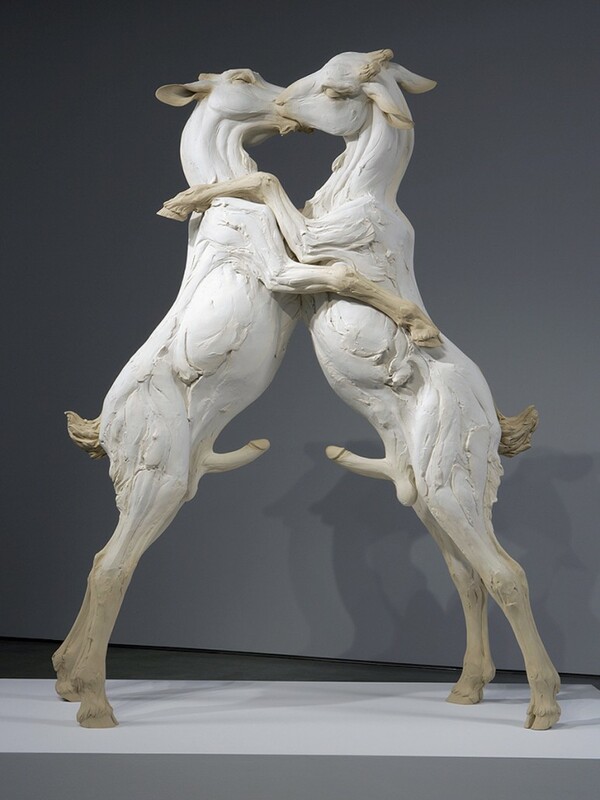 The sculpture is now on permanent display at the Chazen Museum of Art in Madison, Wisconsin. 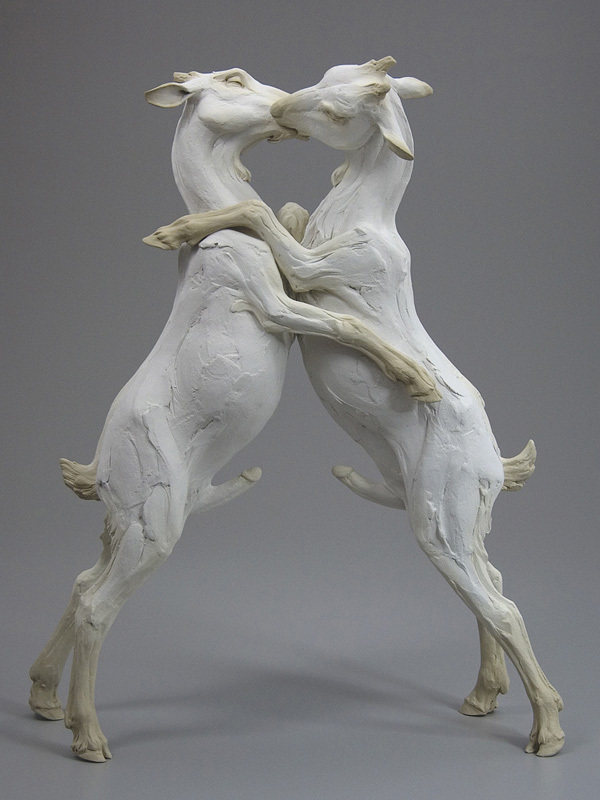 Fired Clay Maquette for "A Rush of Blood to the Head" (14" height). 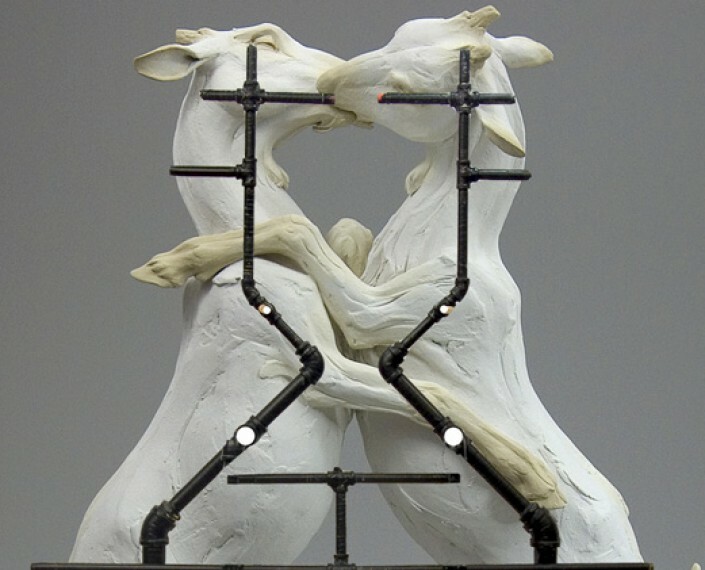 Initial design for the pipe armature overlaid on the maquette. 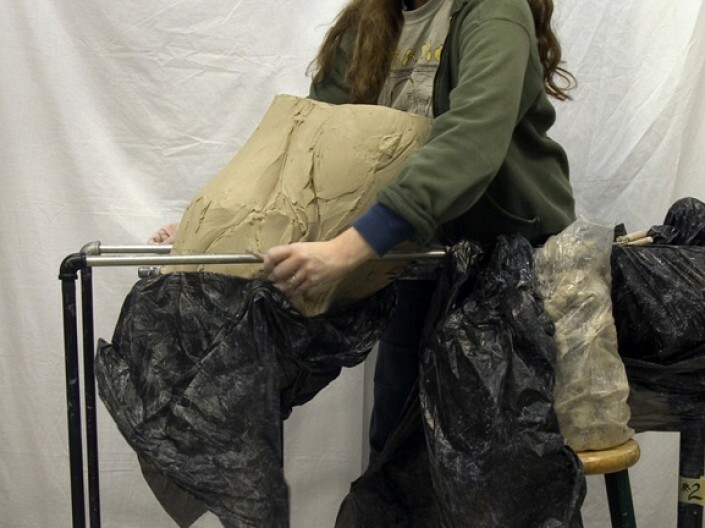 Final armature, wrapped in electrical tape to prevent rusting. Alteration of the initial design provides additional support and flexibility. 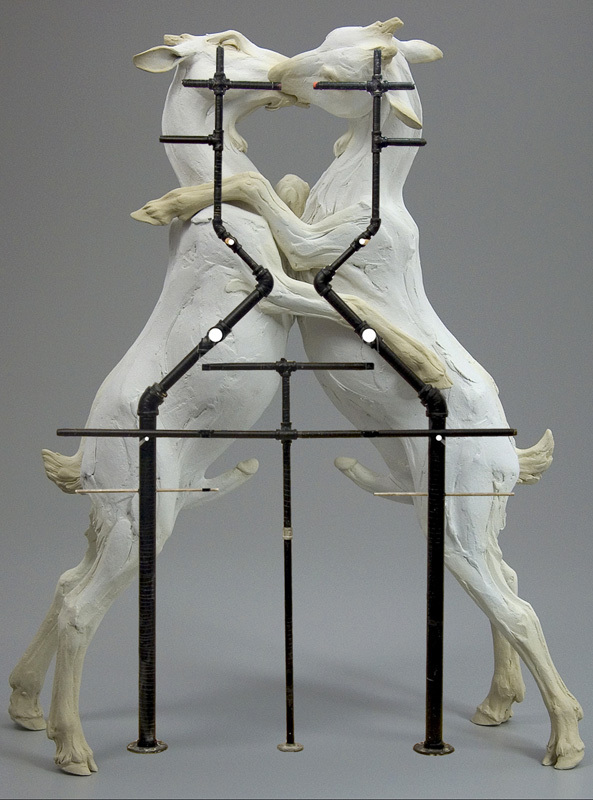 Armature structure Photo shopped in front of the maquette to analyze where the volumes of the forms intersect with the armature. 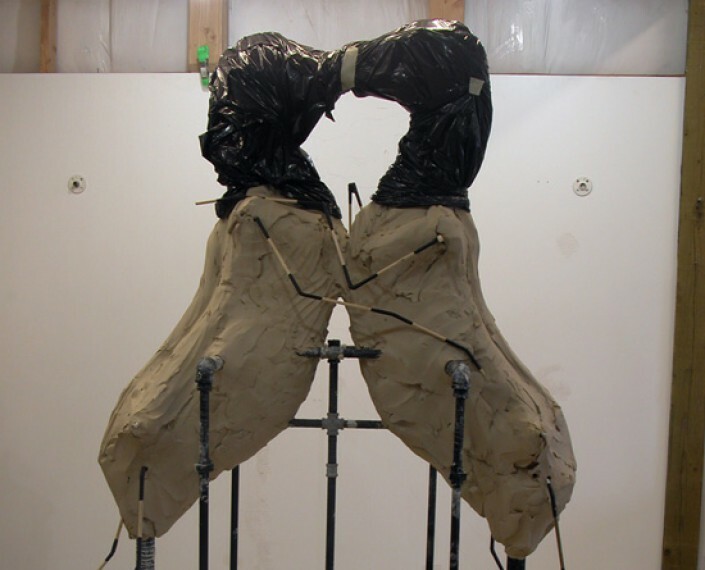 Clay is added to the armature and roughly shaped with a 2 x 4. Using a reference photo of the maquette, the joints of each limb are measured and scaled up on the dowels for the larger piece. Each mark is notched around the circumference of the dowel rod. 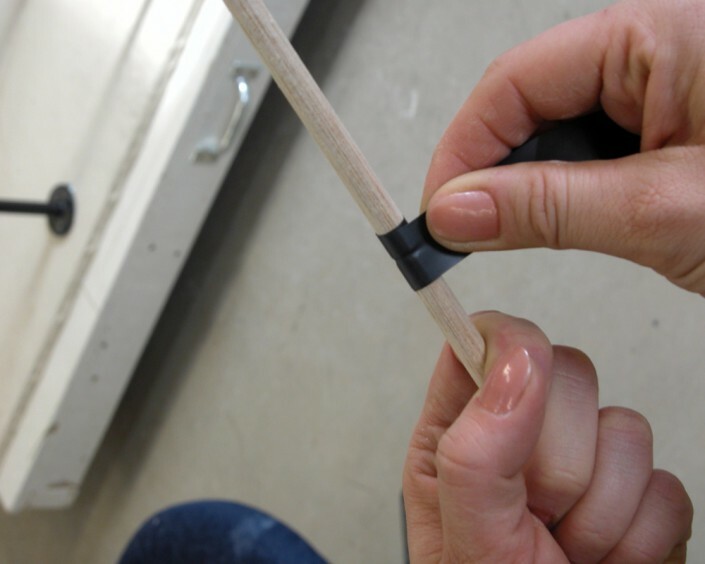 Each notch is wrapped in electrical tape, allowing the dowel rod to be broken at the notch to create a flexible, articulating joint. 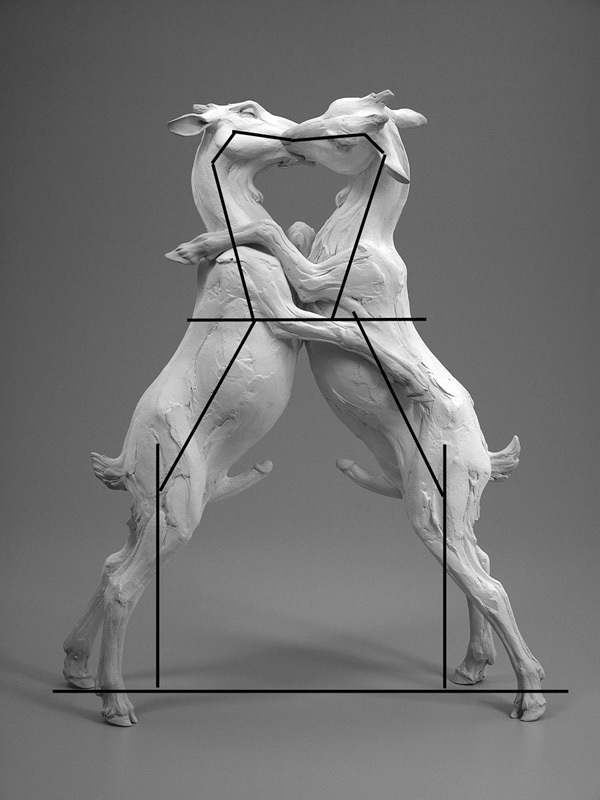 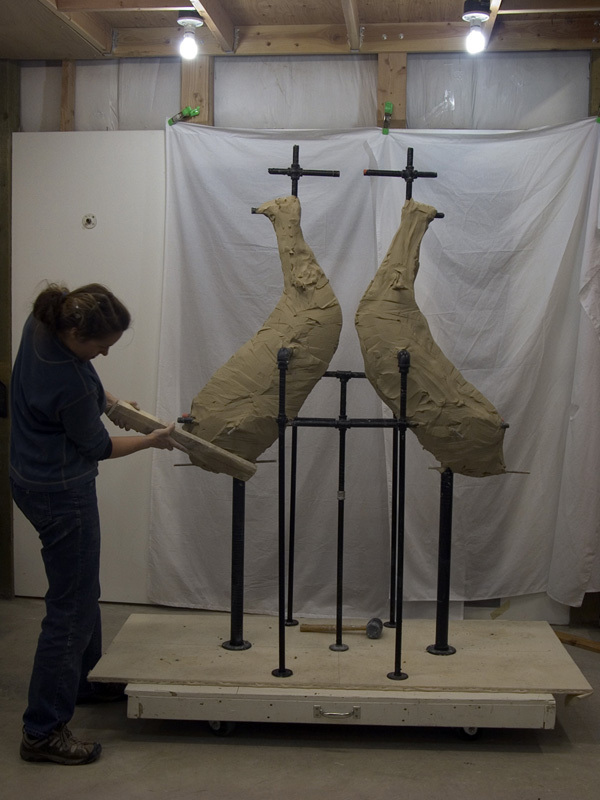 The articulated dowel rods are placed on the sculpture to delineate the gesture. 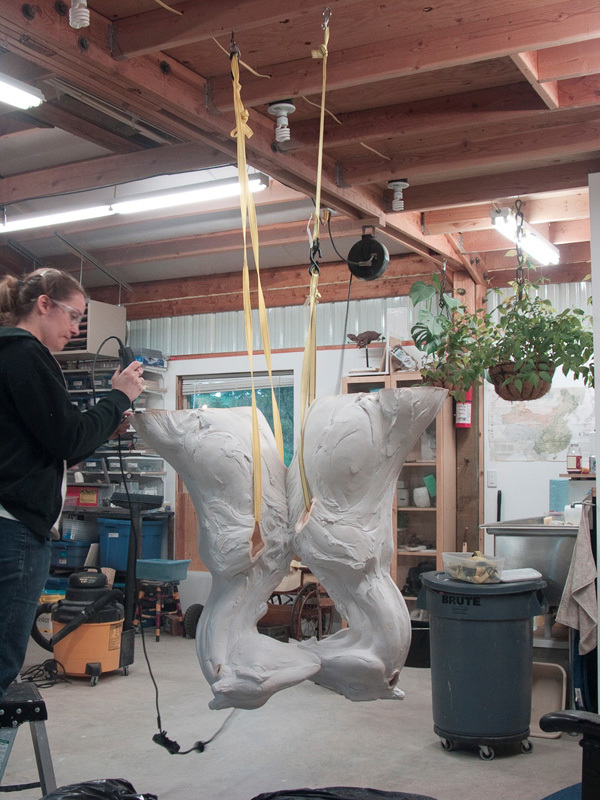 Using a scaffold to work on the sculpture from every angle. 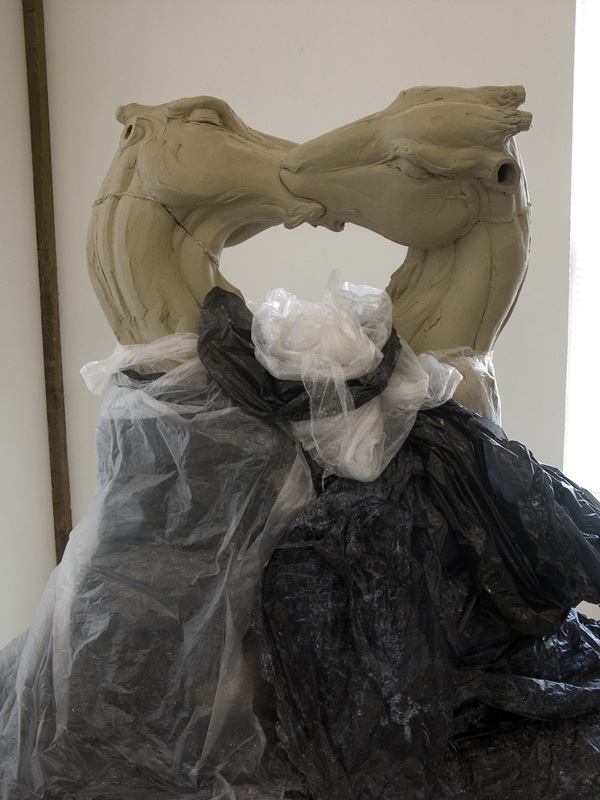 At this stage, the sculpture is wrapped in plastic, to slow the drying process. 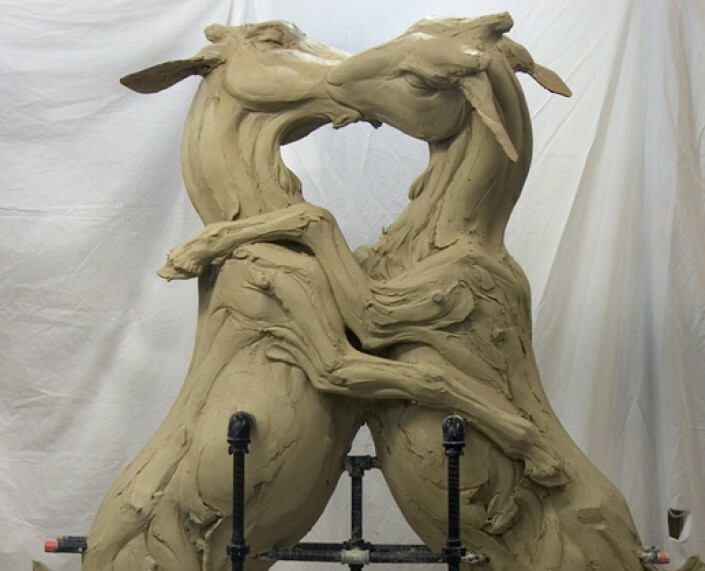 Clay is added to the dowel and the end of the dowel is inserted into the sculpture. 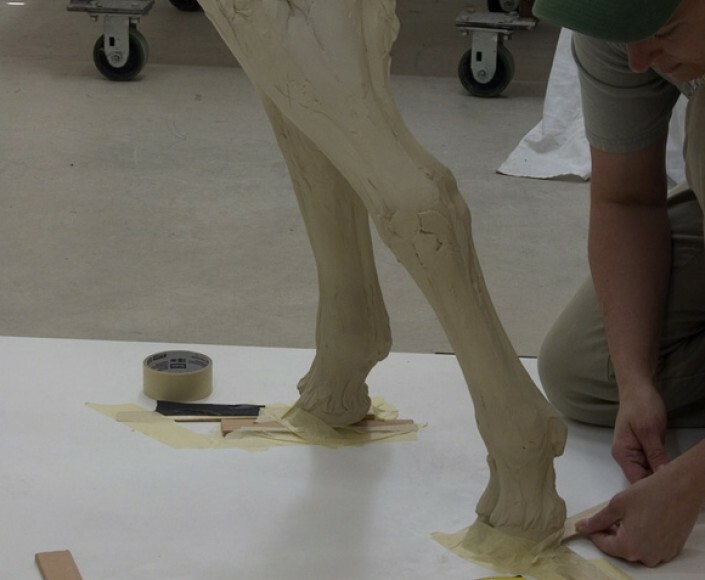 The limb is positioned and detailed. 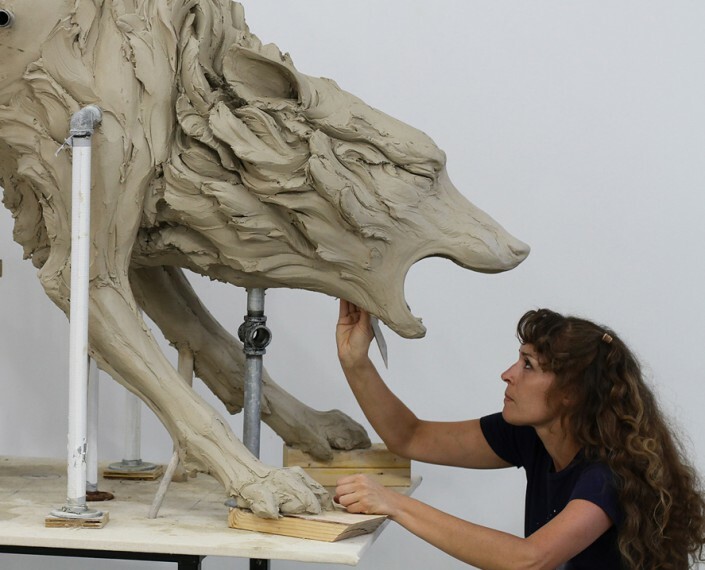 Solid sculpting is complete. Cardboard inserts are added in place of more delicate features such as the ears and, on other works, the tail. 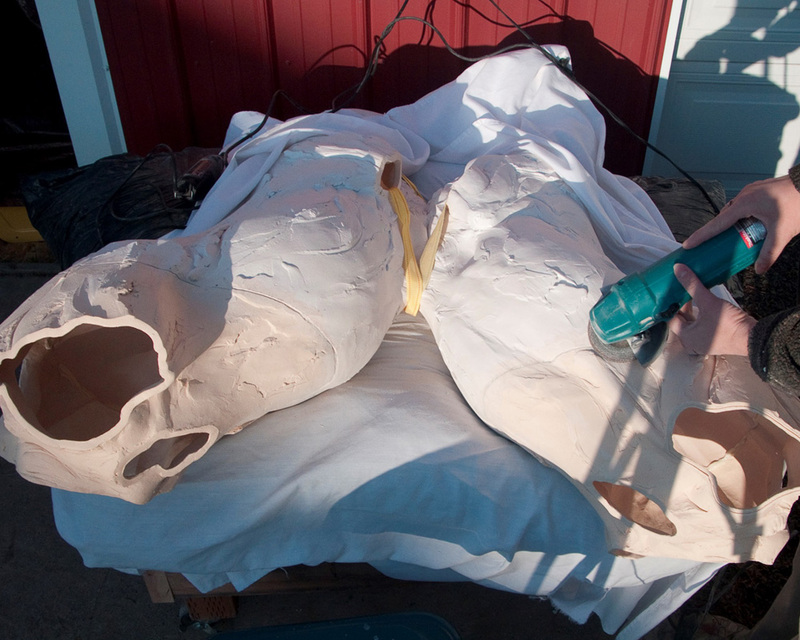 Hollowing begins by removing each leg, to conserve moisture in the extremities. The leg, with the dowel intact, is placed on a conforming pillow. 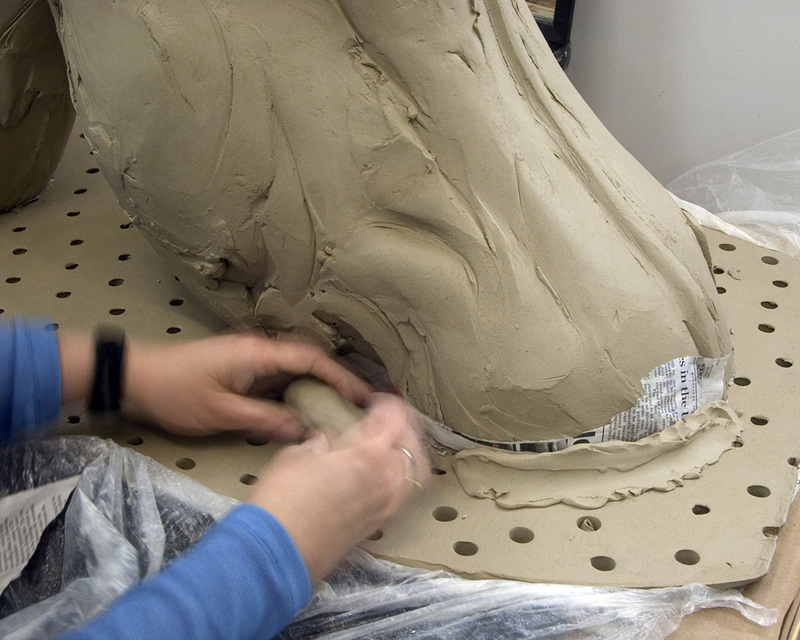 Registration marks are drawn on the ankle and the first section is cut with a wire tool, twisting and sliding the foot off the dowel. 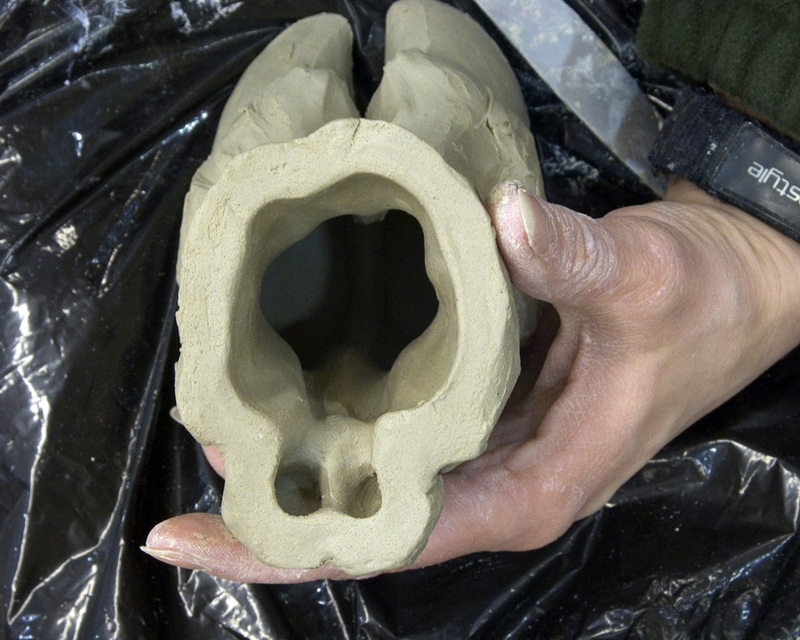 Hollowing is performed in sections. 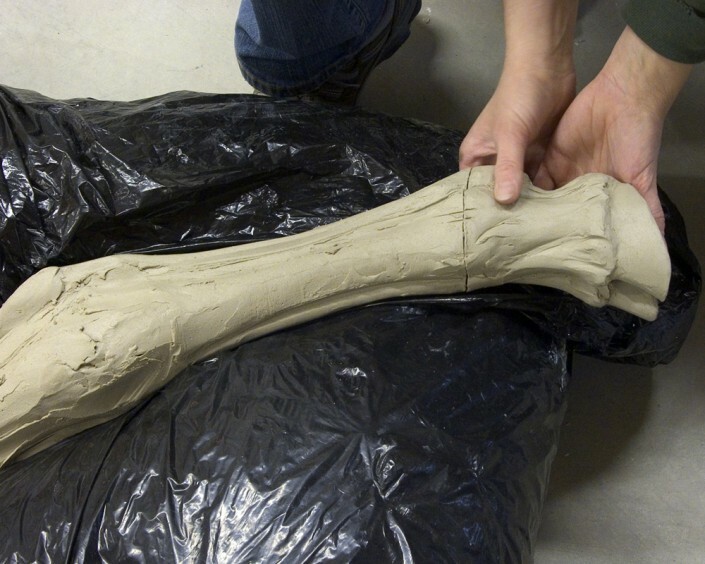 Each section is pulled off the dowel rod, leaving the rod inside the leg to maintain structural integrity. 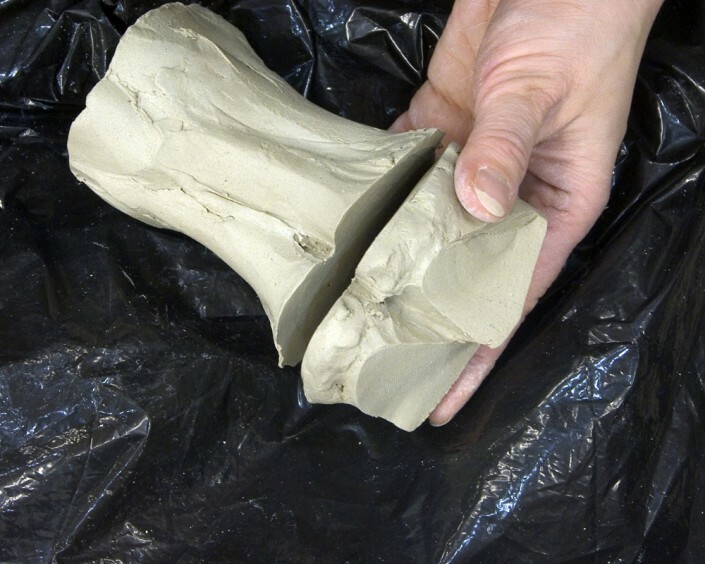 Prior to hollowing, the section is compressed and detailed. 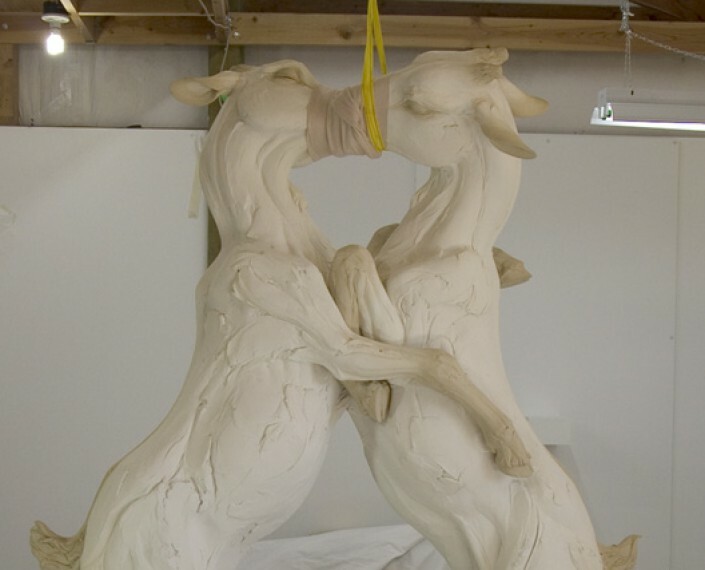 Smaller sections are then cut, beginning with the tips of the hooves. 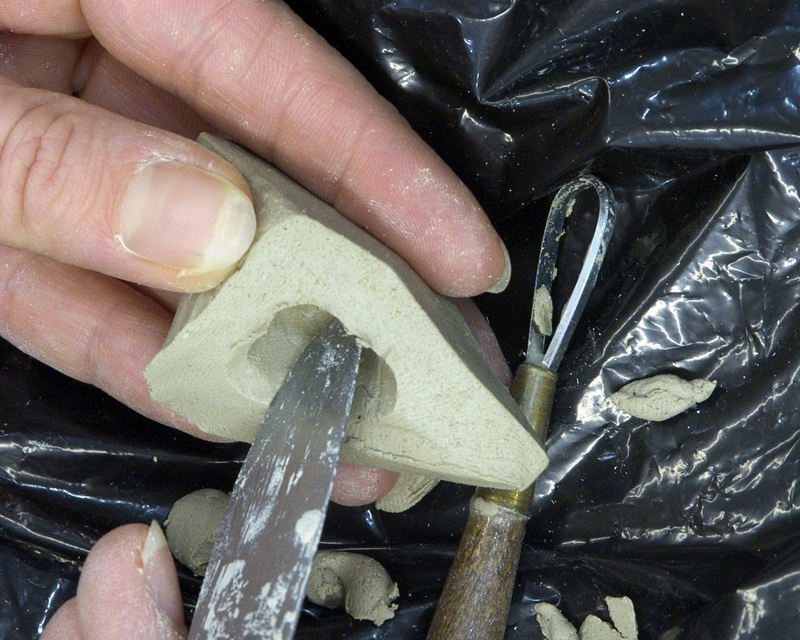 Hollowing begins by removing clay with a loop tool. After the core is removed, the wall is scraped and compressed to realign the clay platelets and strengthen the piece. The next portion is then cut and ready to hollow. The next section is hollowed and compressed before rejoining to the toes. 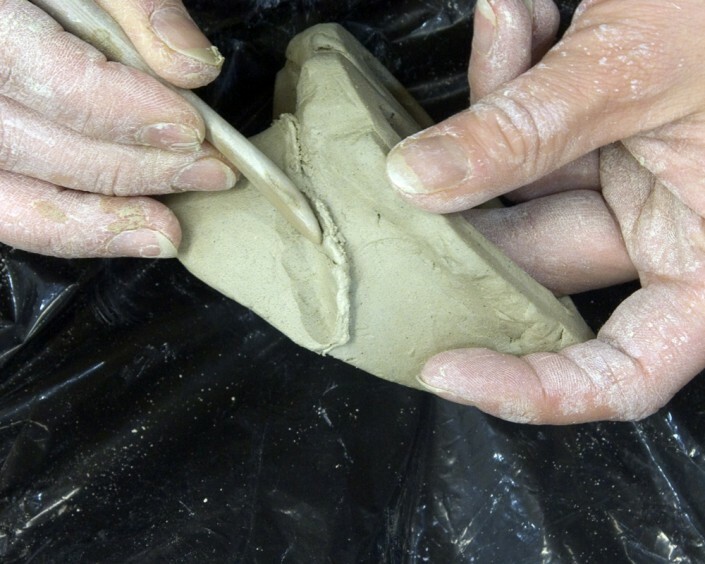 For rejoining, the edges of sections are scored and slipped and scored again. 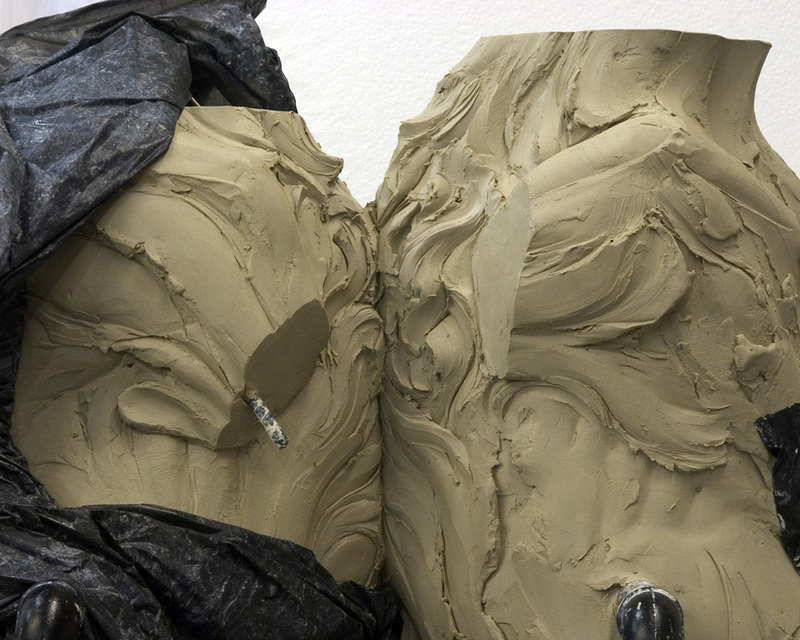 The sections are pressed together, squeezing out as much slip as possible. 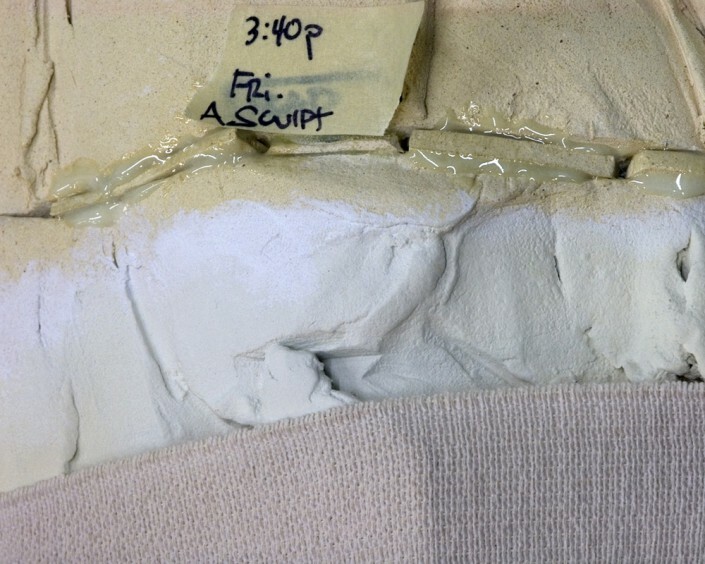 The excess slip is removed and the seam is then "knitted" together. 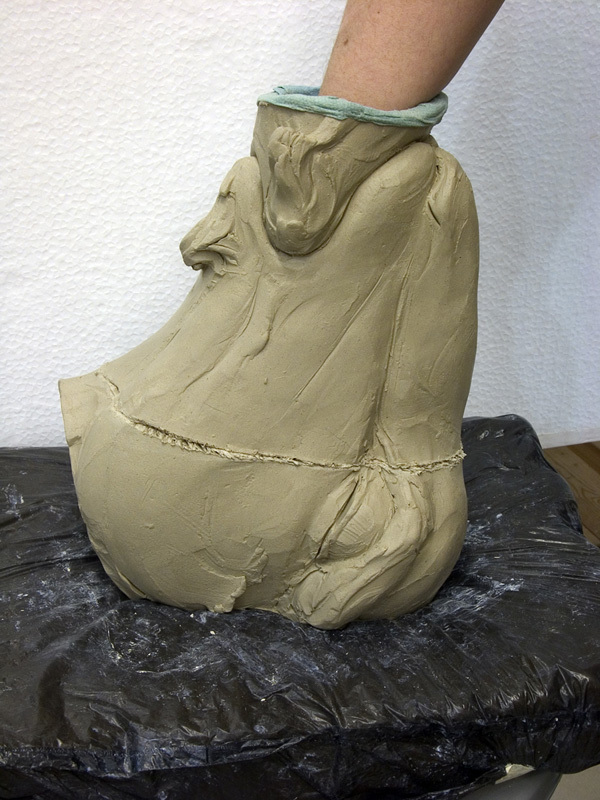 The seam is scored and a compressed coil is added, and the surface is re-sculpted. 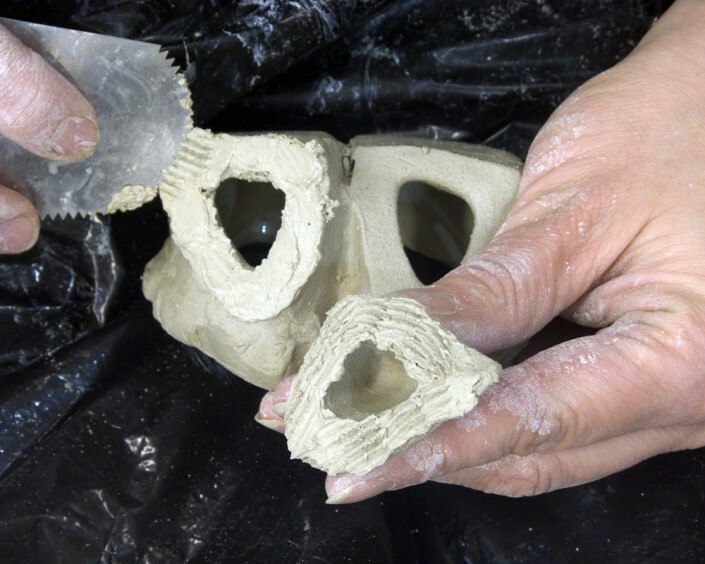 Each of the hollowed sections is re-joined using the same process. 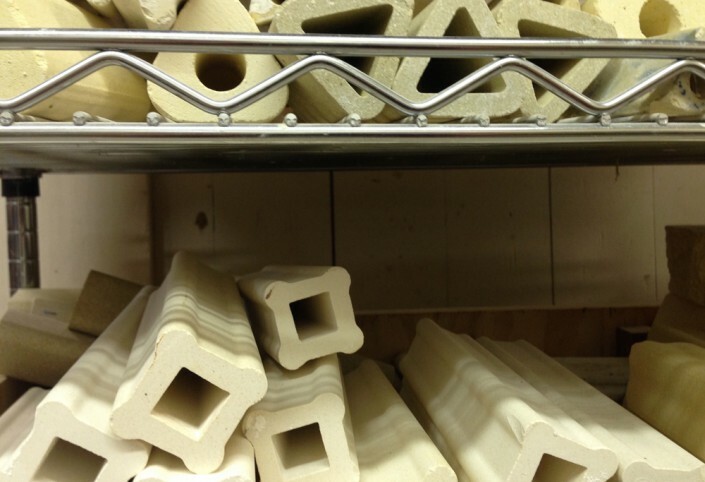 A uniform thickness is maintained throughout each section. 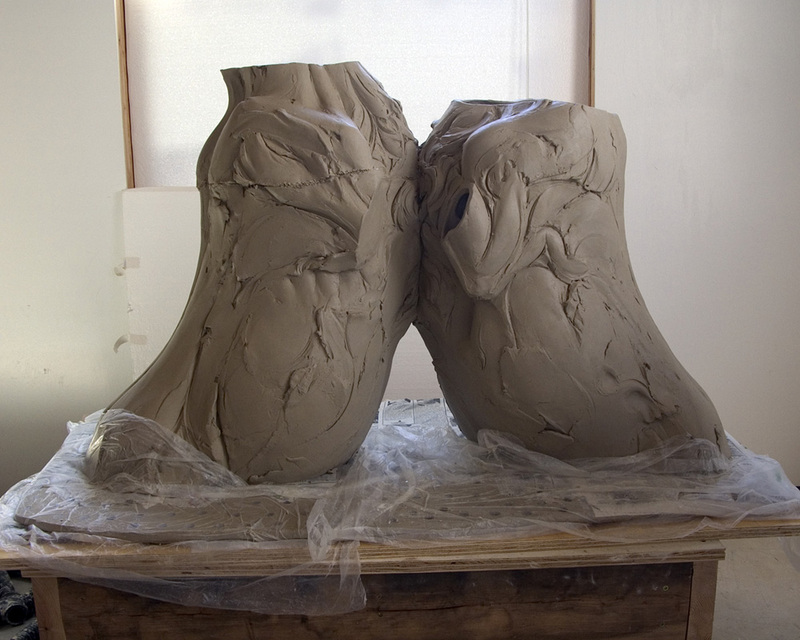 For large work, the walls are left thicker on the weight bearing areas of the body. 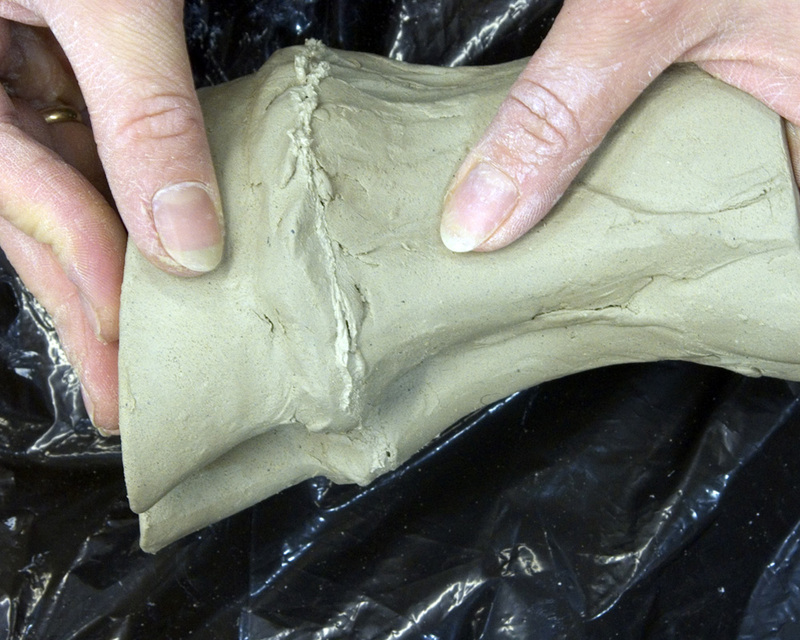 Warping during hollowing and compression is corrected by checked it against the adjoining solid section. 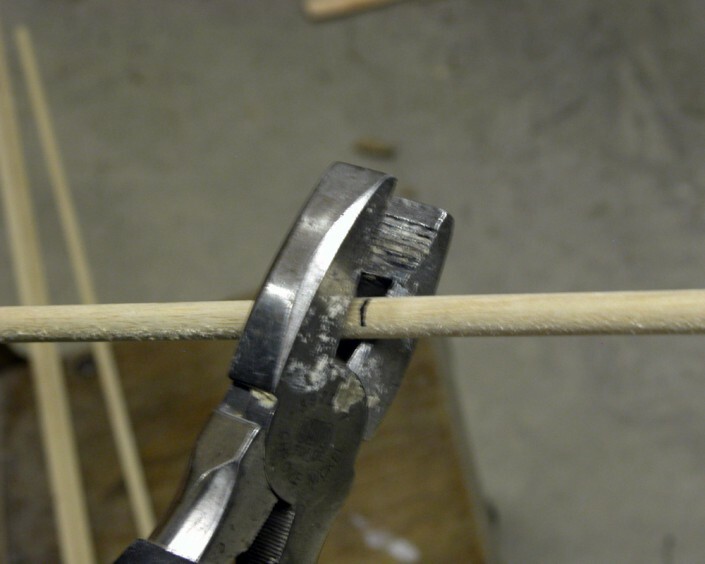 Dowel rods can be used for compressing difficult to reach areas. 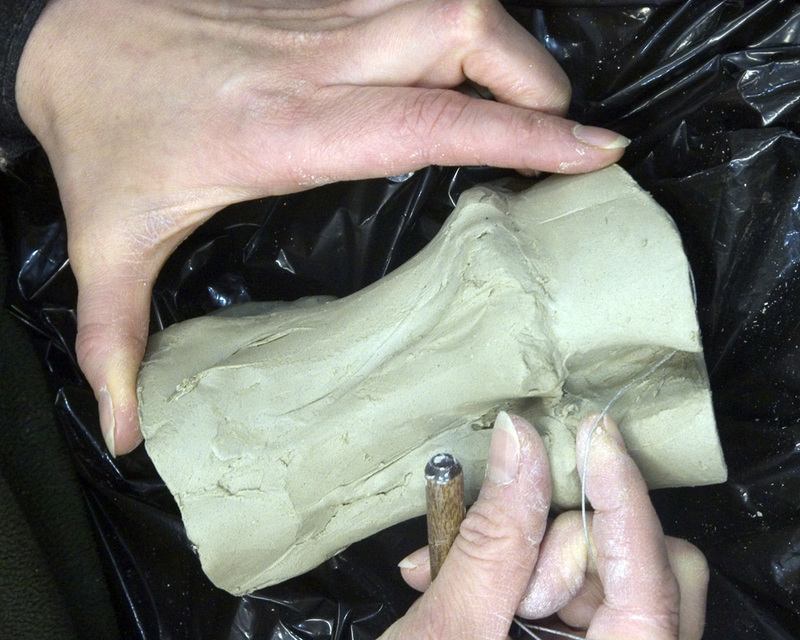 The finished, compressed shin section. 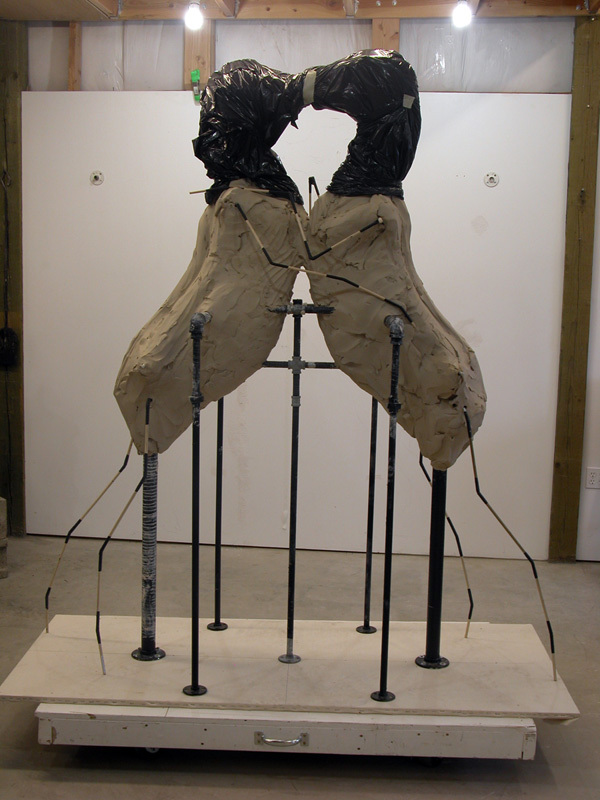 After each section is hollowed and joined, gestural marks and textural details are finalized. 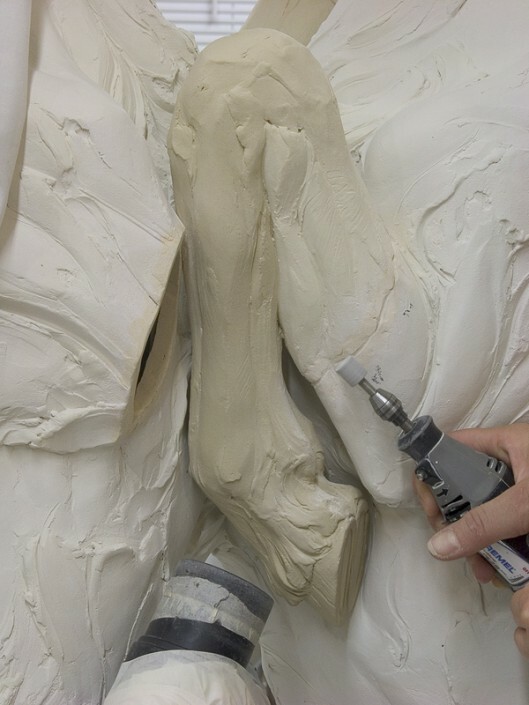 As a general rule, the cuts are made at the anatomical joints in the body, where the form has the most volume and surface variation. The final section of the hollowed leg, up to the hip joint. 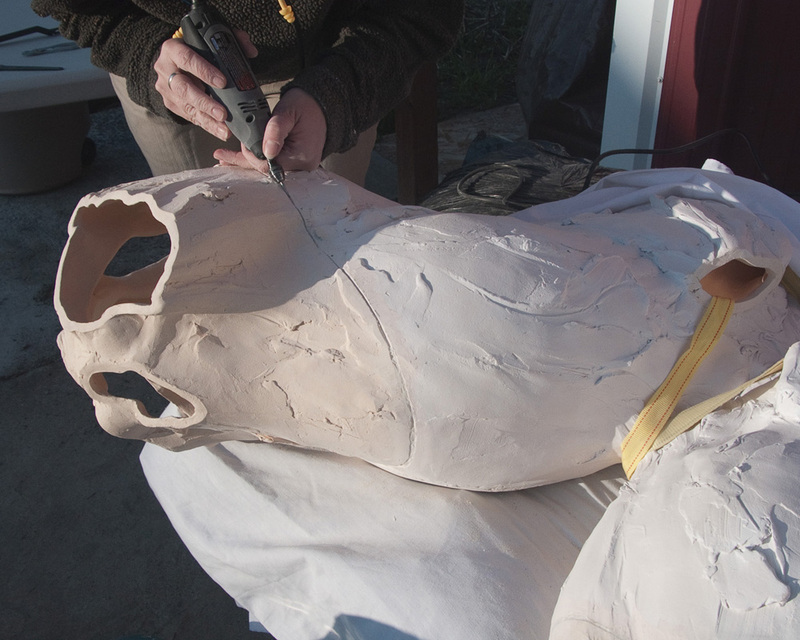 After the limbs have been hollowed out, the process will continue from the heads down. As sections of the sculpture are cut off, portions of the armature are exposed and removed. 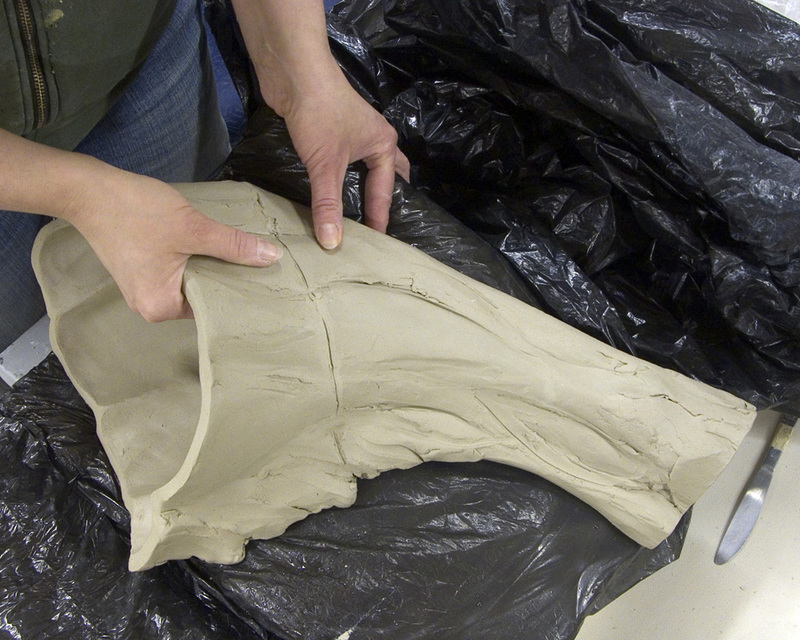 Each section is hollowed as it is removed. 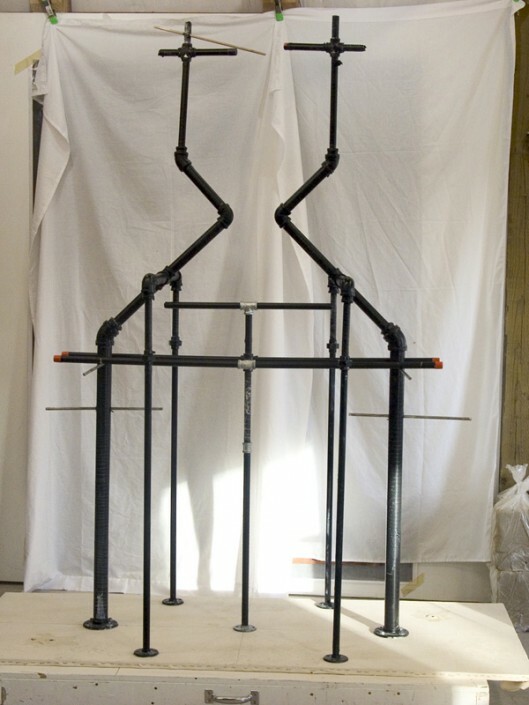 This section is cut strategically to expose the ends to the armature pipe. 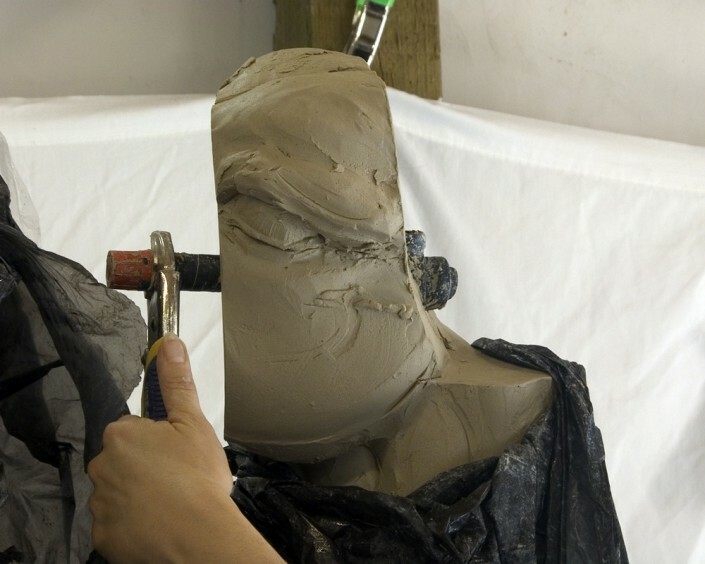 The exposed armature is removed in order to facilitate the next cuts. 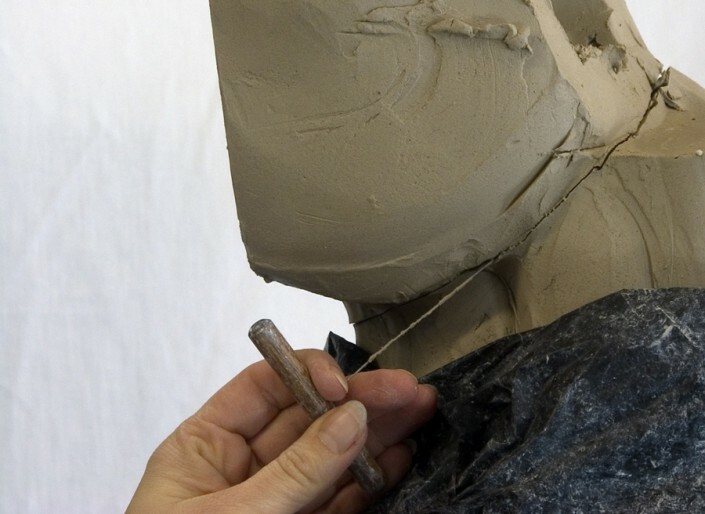 The last section of the head support is removed. 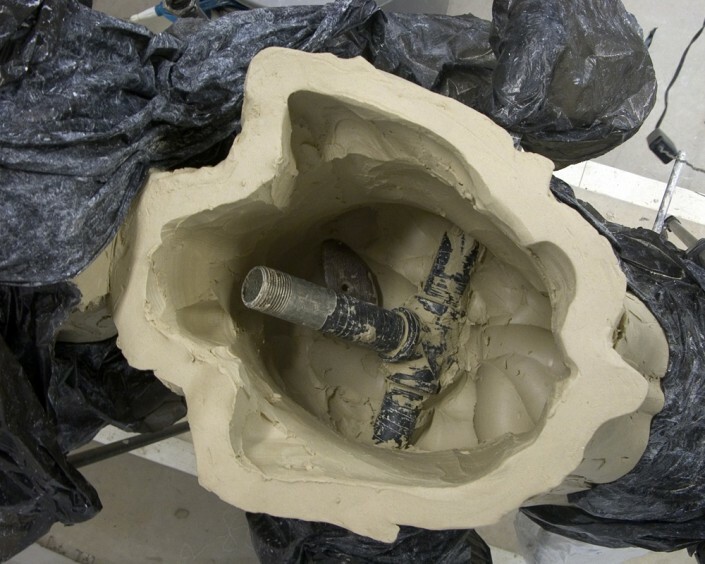 In order to access and extract the pipe connections, the surrounding clay is removed. 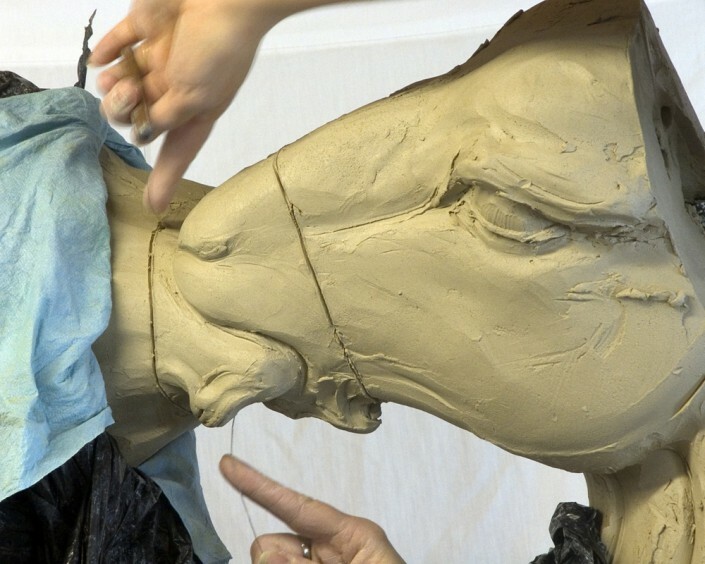 As each piece is cut and hollowed, a great amount of detail is added to enhance the gesture and expression. Here, the seam is supported from the inside as the sections are rejoined. 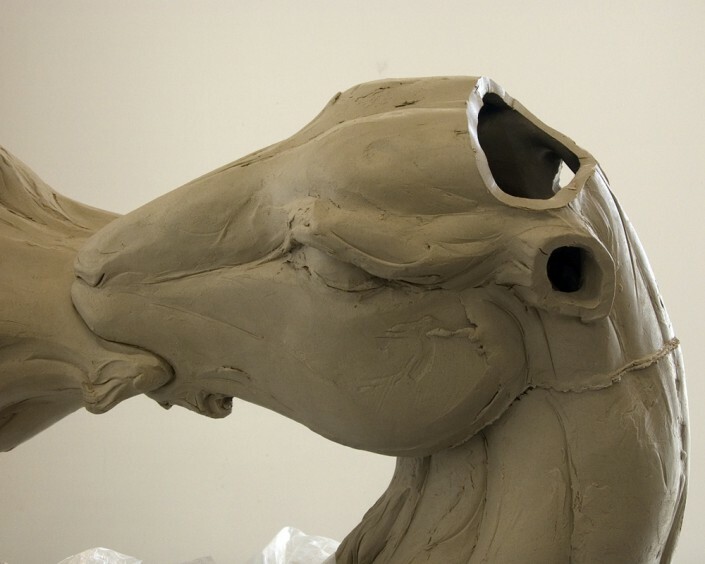 As parts are removed, other areas become more easily accessed for additional detailing. 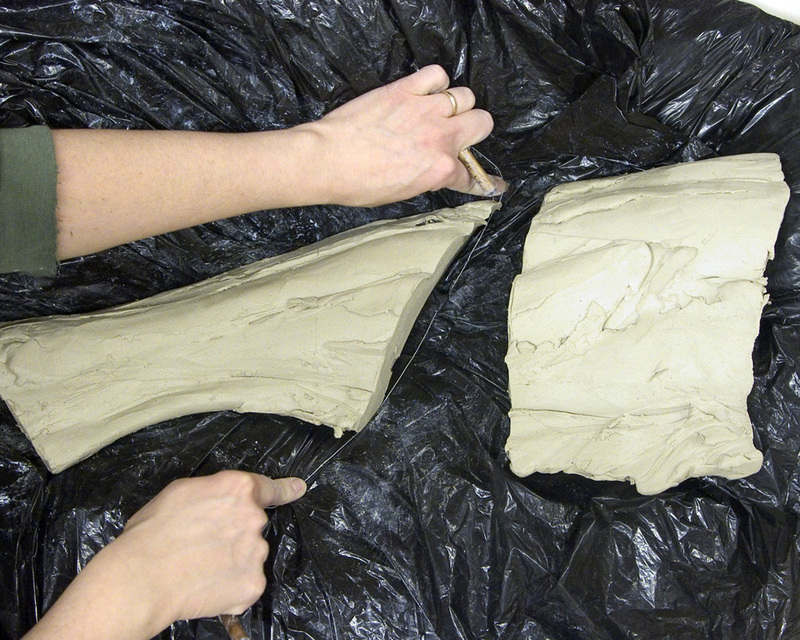 On the larger sections, the mass of clay is pre-hollowed down to a 2” wall and allowed to stiffen to make it easier to cut and hollow further. 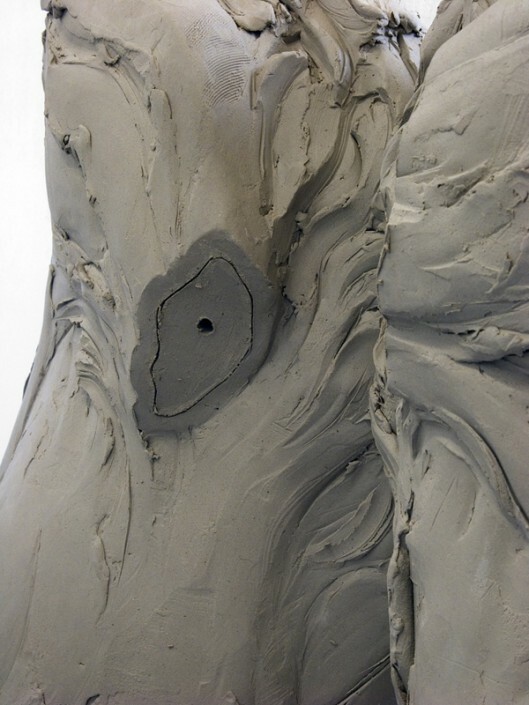 While smoothing and compressing, the wall can be pushed outward from the inside to enhance the sense of volume. 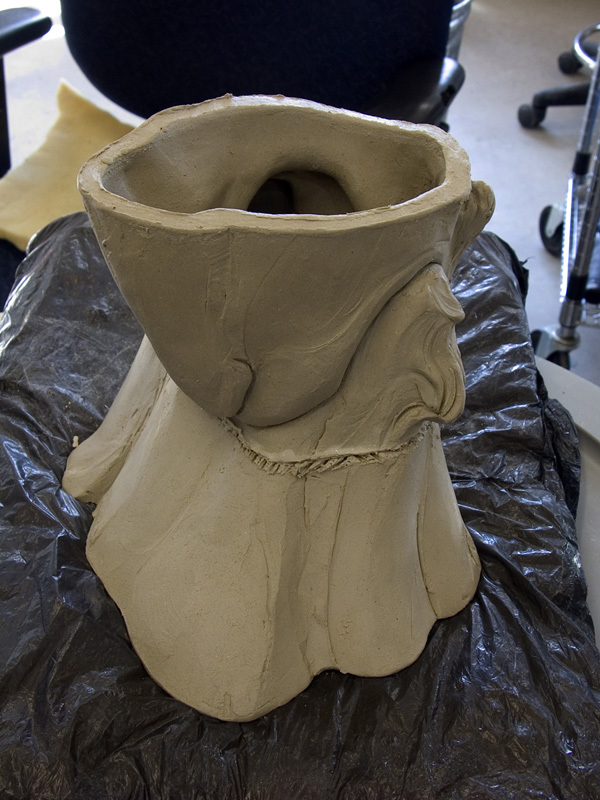 A "cutting guide" is constructed to ensure a straight cut across the torso in order to provide a level surface for loading on the floor of the kiln. 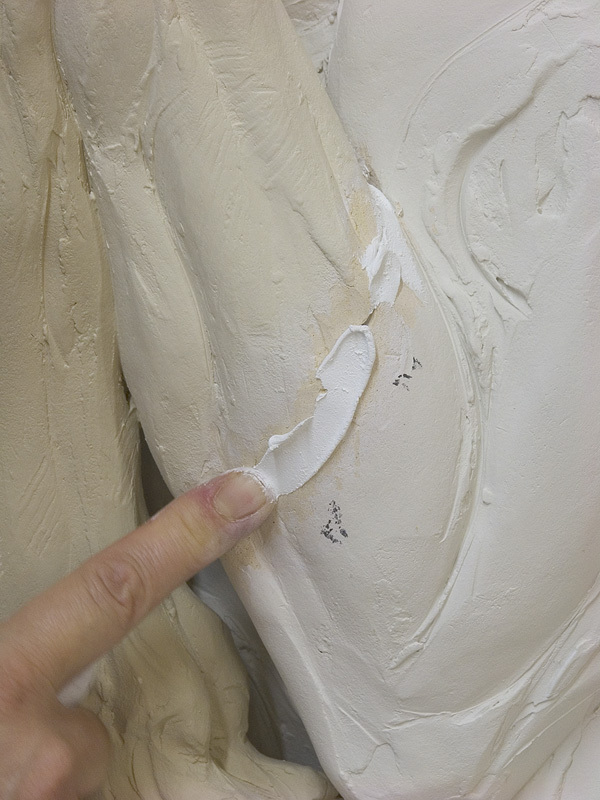 The cutting guide re-positioned for the other torso. 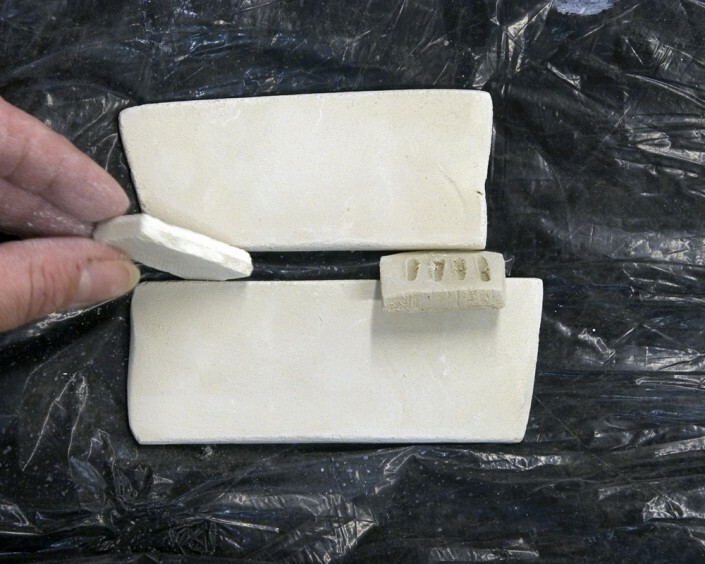 Make a shrink slab the same thickness as the walls of the piece. 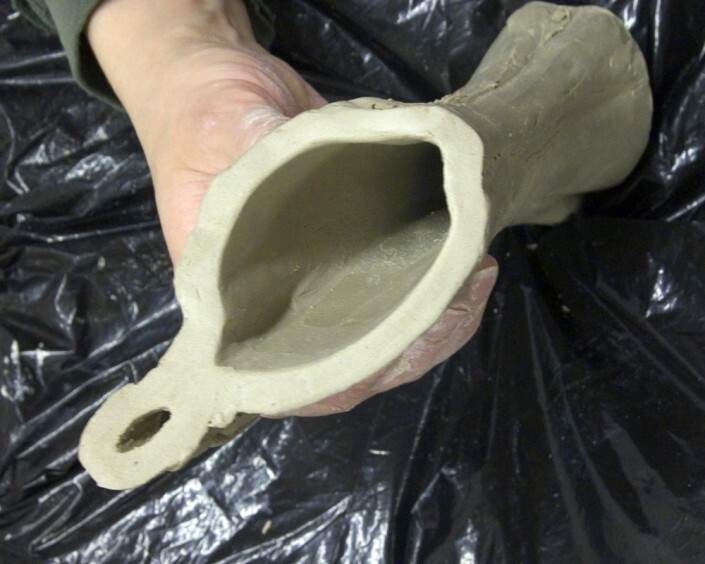 Holes allow heat to move under the piece, acting as expansion/contraction relief. 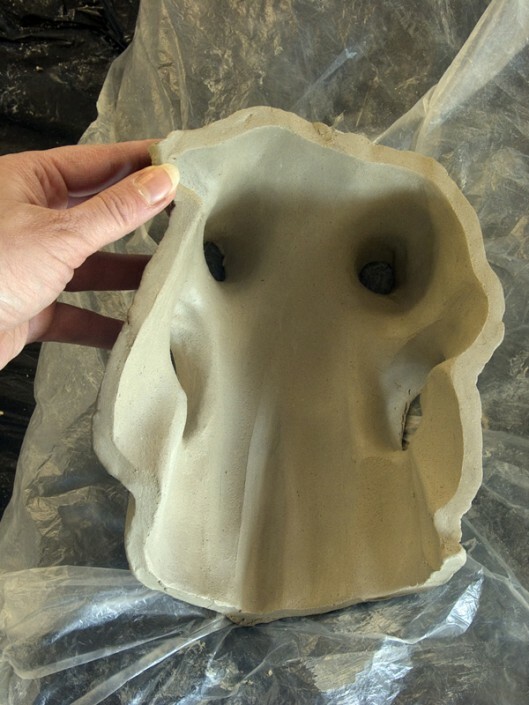 The shrink slab also provides a surface the piece can move with during firing to reduce cracking and deformation. 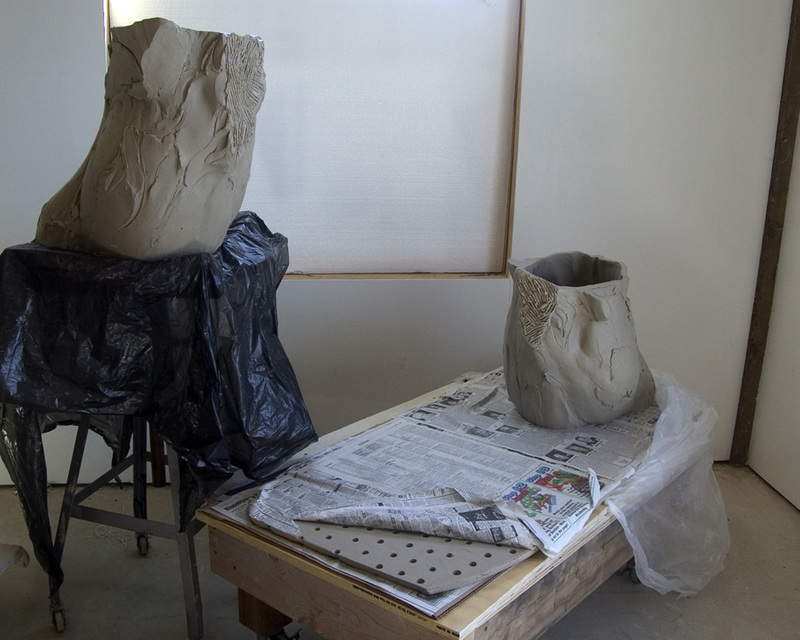 The torso is reconstructed on top of the shrink slab, separated by 2 sheets of newspaper. 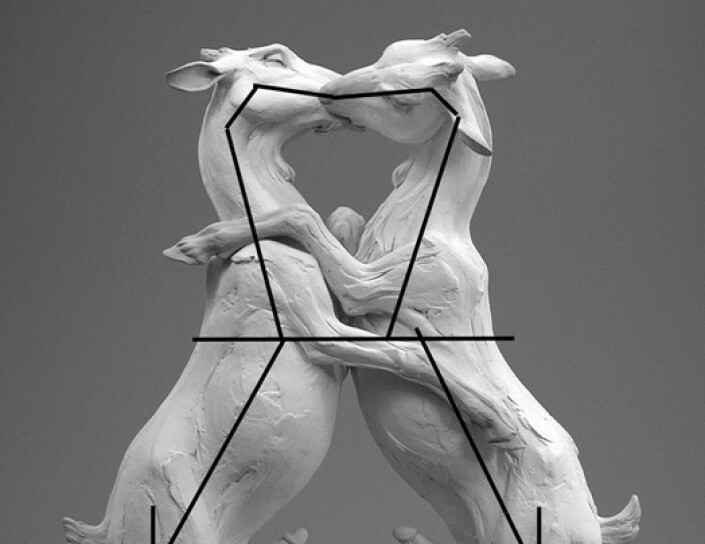 Aggressive joining and compressing is important, particularly on larger forms. 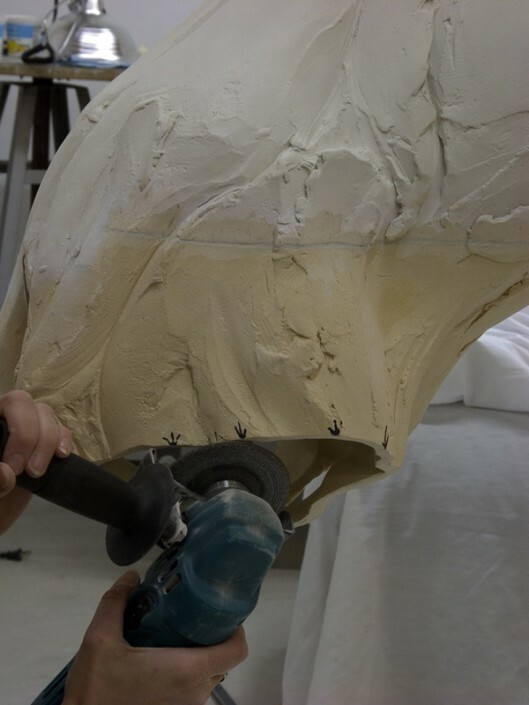 The larger joined sections are allowed to ‘rest’ overnight, allowing the moisture to equalize, while wetting the next edge to be joined. 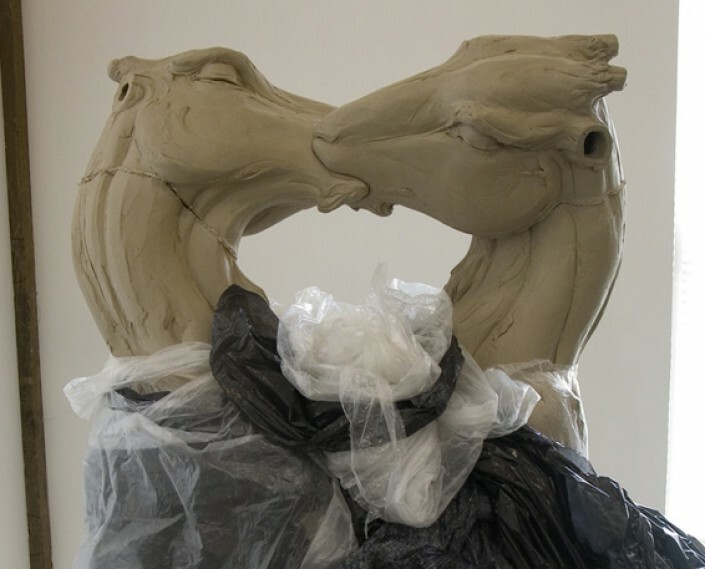 The heads are scored and slipped and placed on the necks. The seam needs support on the inside while being compressed and joined, so the tops of the heads are removed in order to allow access. 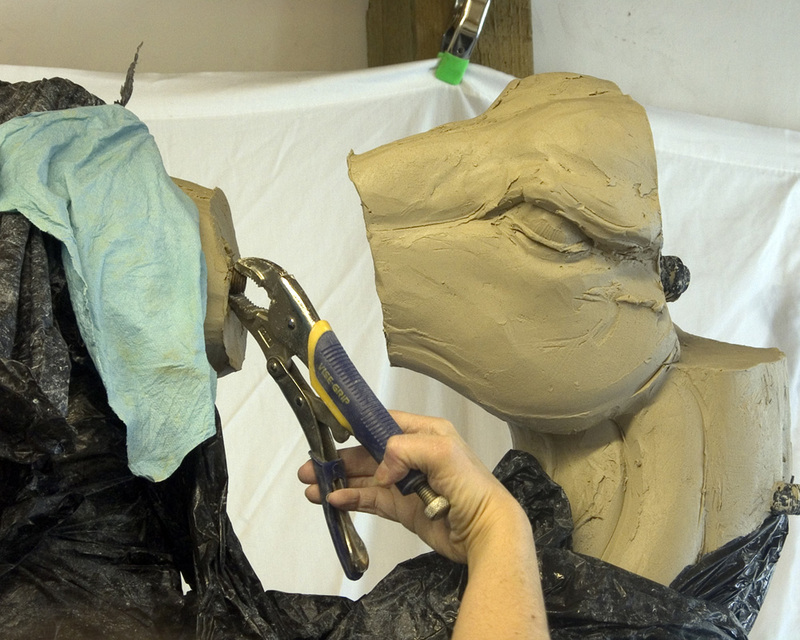 The reattached head on the right is wrapped in plastic while the seam on the left neck is dampened for rejoining. 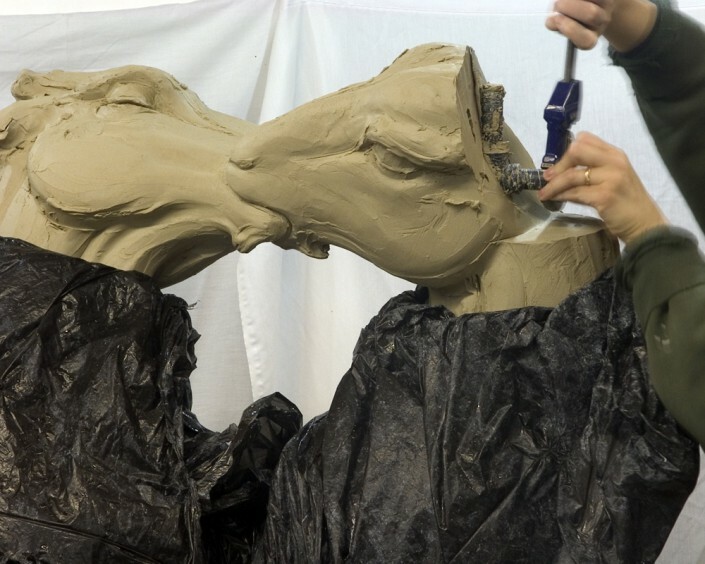 The access sections on the tops of the heads are reattached. 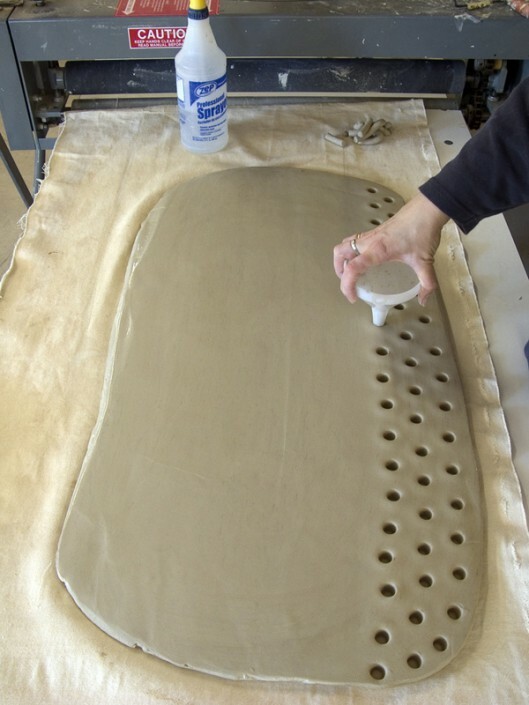 To prevent distortion in the leg openings during firing, placer slabs are fitted for the holes. The center hole assists in the removal of the slab after firing. 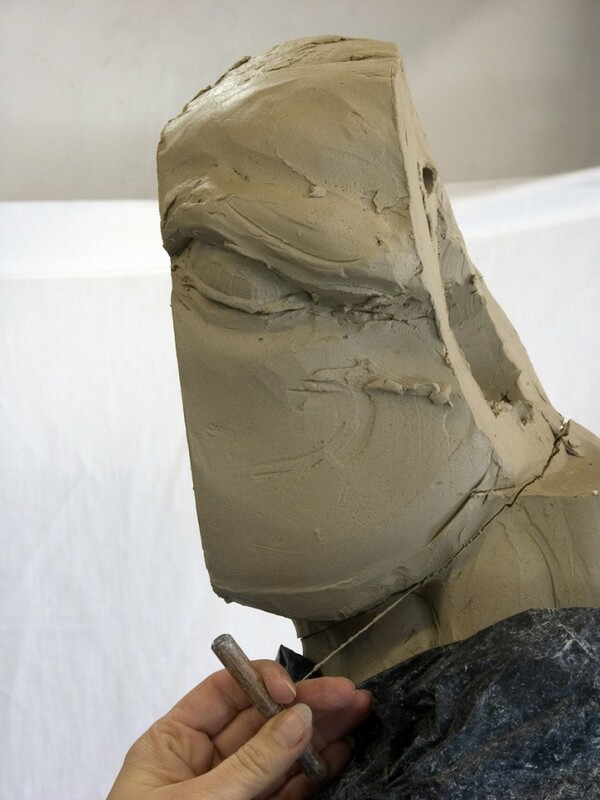 A template of the opening is used to make the placer slab. 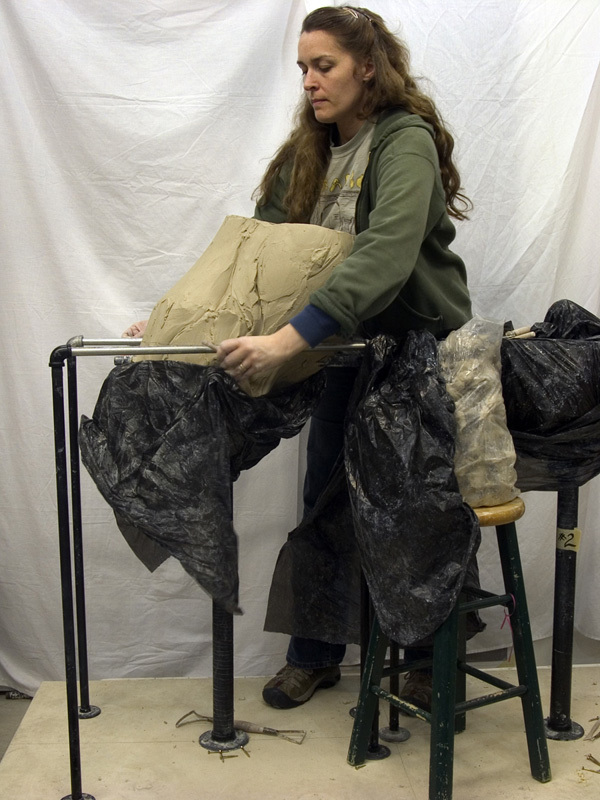 Paper is inserted between the slab and opening. 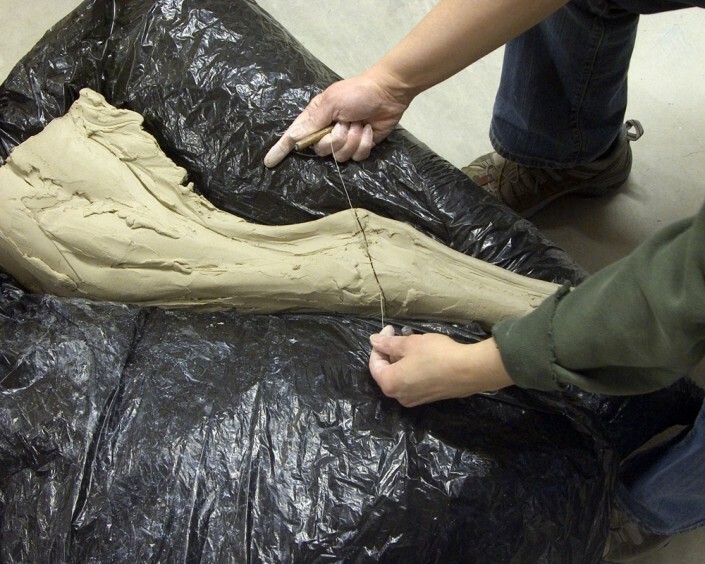 A channel for epoxy is created. 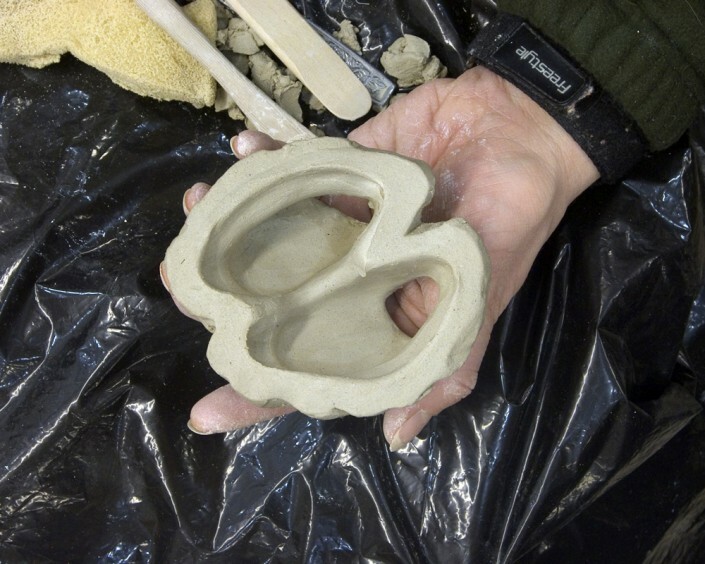 A "retaining wall" is constructed around the base of the piece to reduce the risk of shifting during firing. 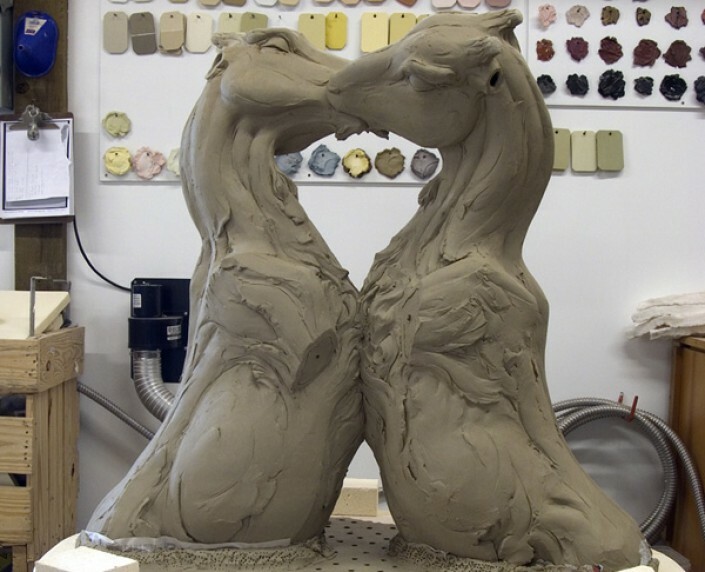 The piece is loaded onto the floor of the kiln. 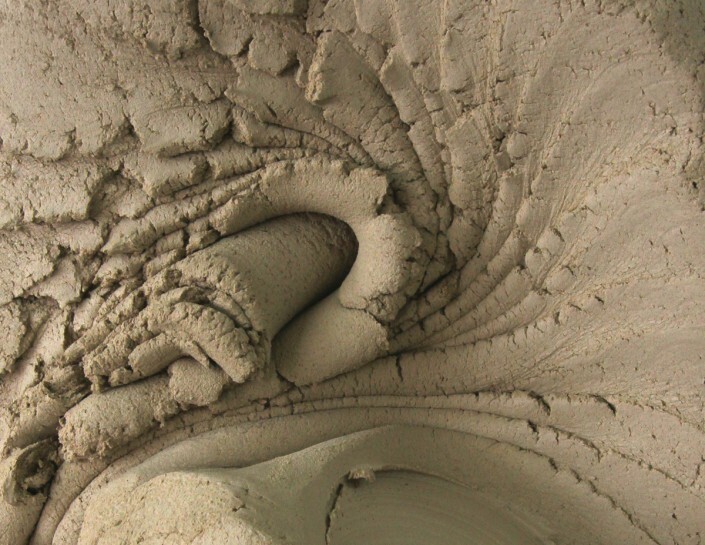 The retaining wall is perforated to allow it to dry quickly and heat evenly. 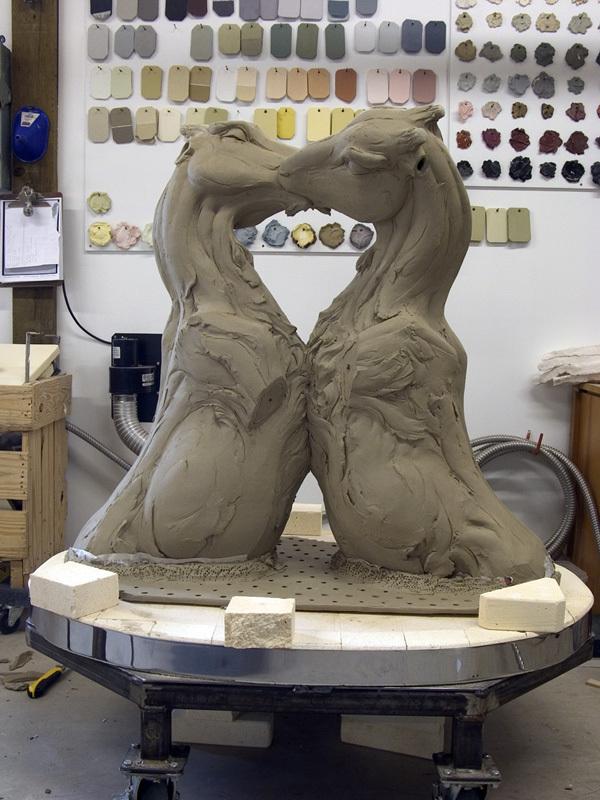 Once loaded, the kiln rings are restacked. Cone packs are used to measure variances in temperatures that may cause differences in shrinkage rates. 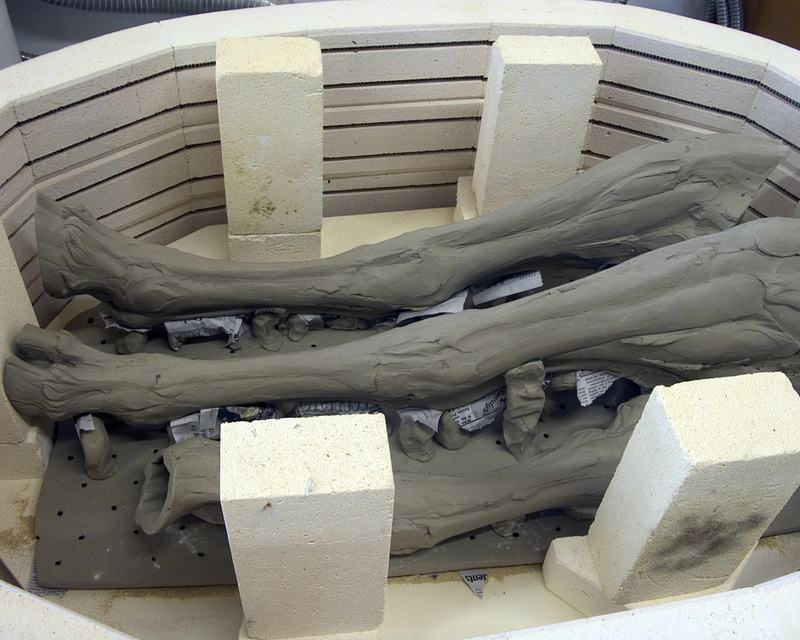 The first layer of limbs arranged in the kiln on a shrink slab. 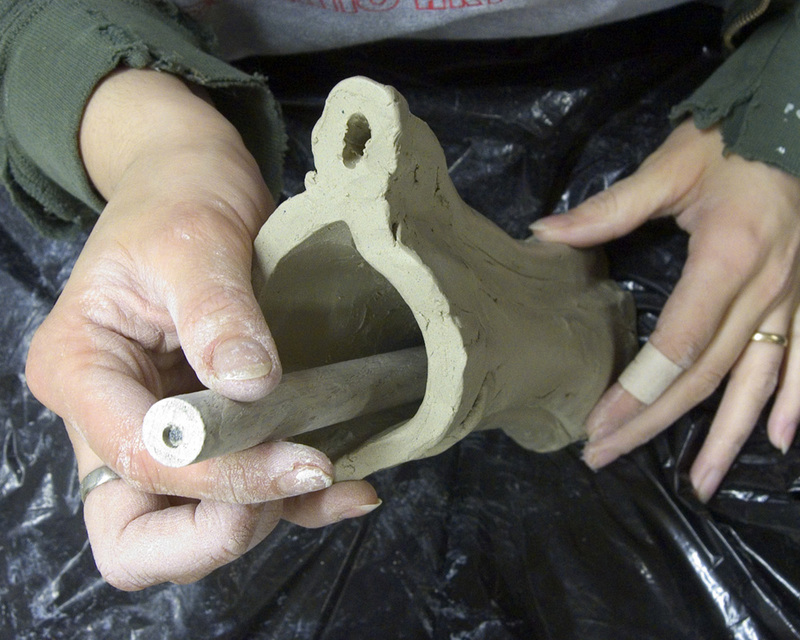 Keeping like parts next to one another during firing reduces the risk of different shrinkage rates. 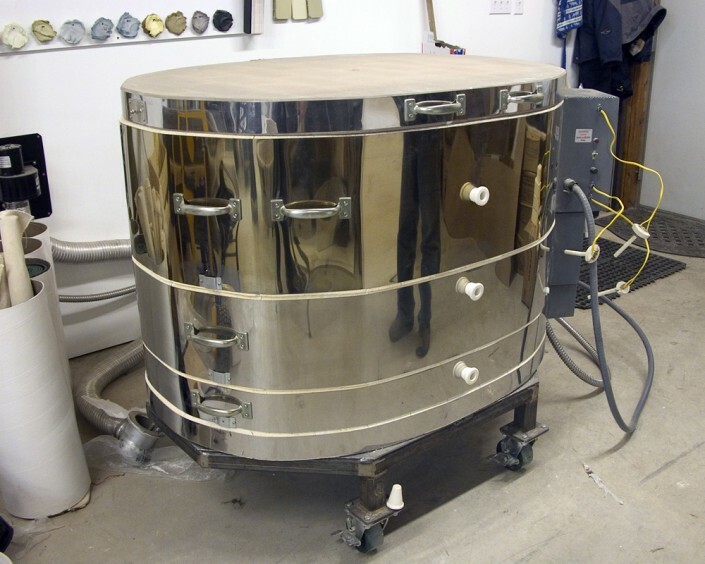 Reassembled kiln ready for firing. 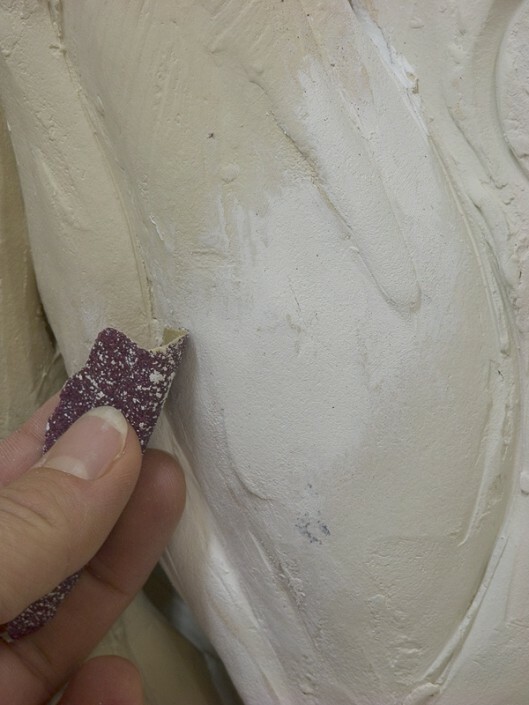 The surface is very lightly sanded with 150 grit sand paper to remove sharp edges and loose clay. 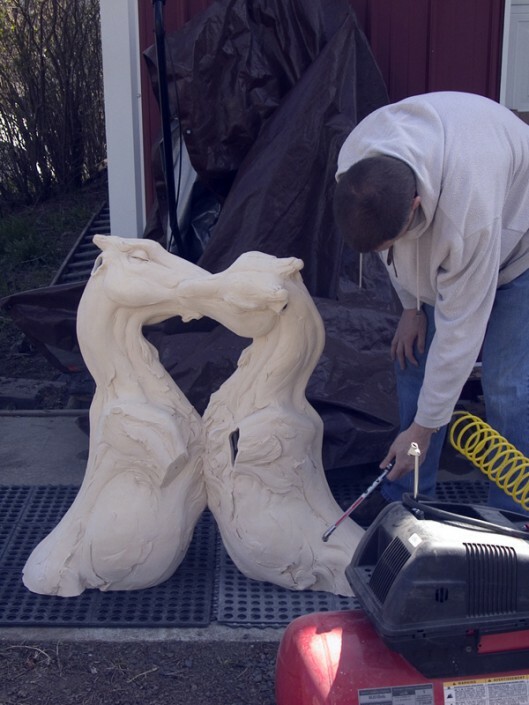 The piece is power washed and dried to remove all the dust. 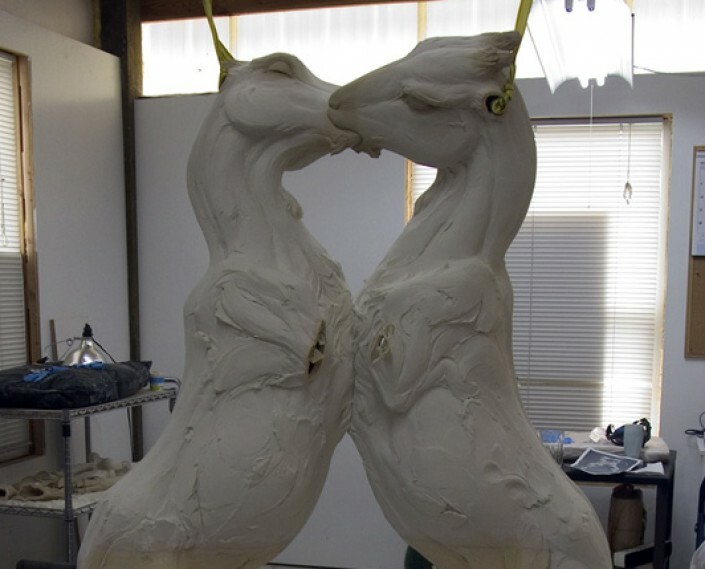 Two thin coats of primer are applied, approximately three hours apart. 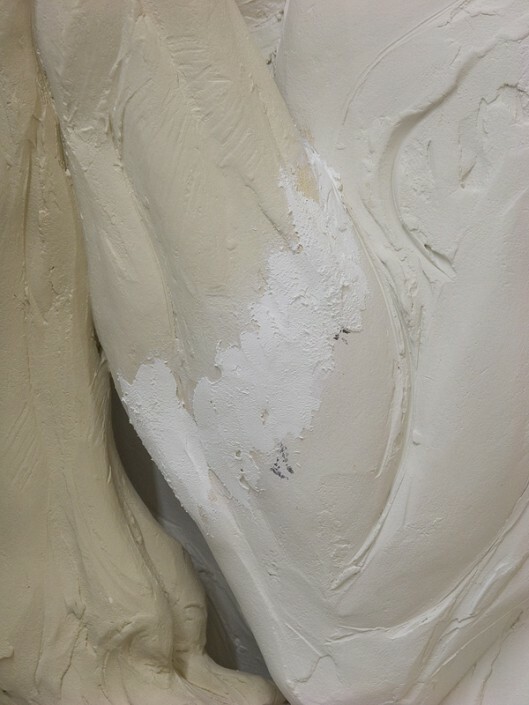 The second layer of primer is tinted to show where it has been applied. 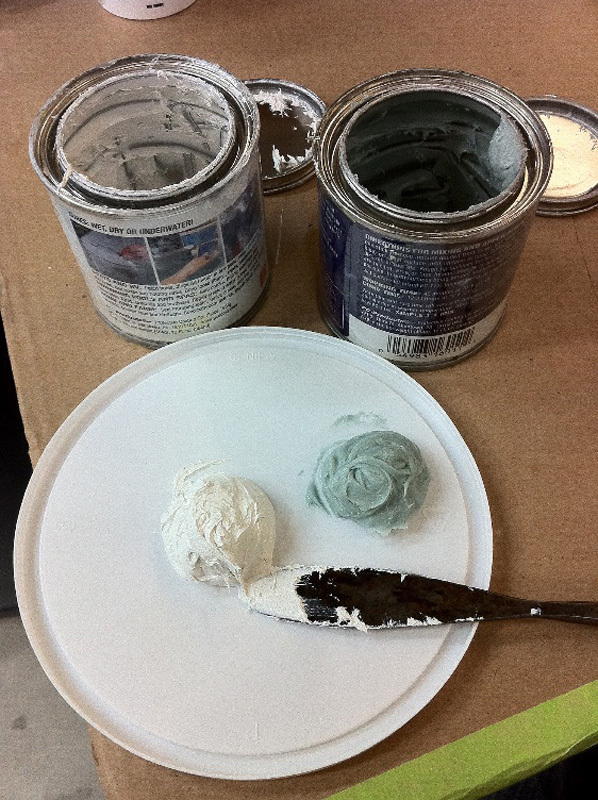 Brushes used for priming and painting. 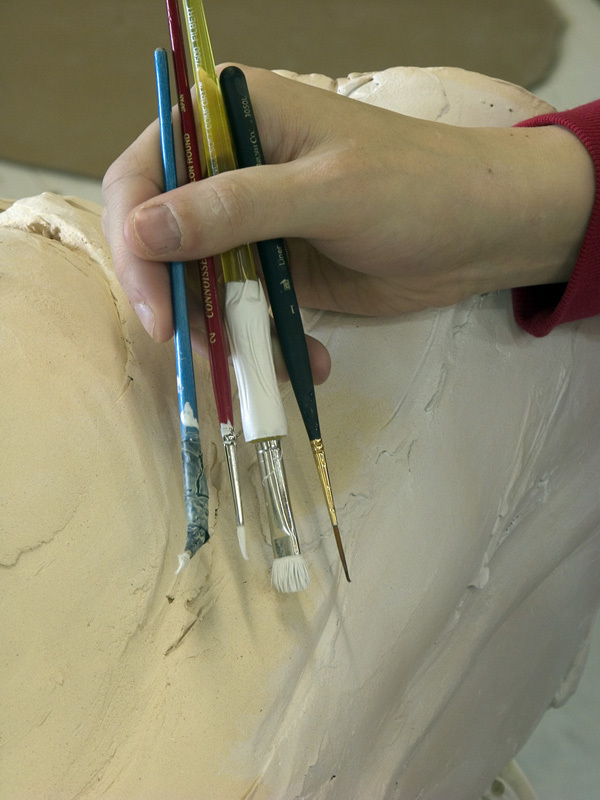 Small brushes reduce the risk of applying excess paint and obscuring textural marks and sculptural details. Grinding the edges for a final fit. 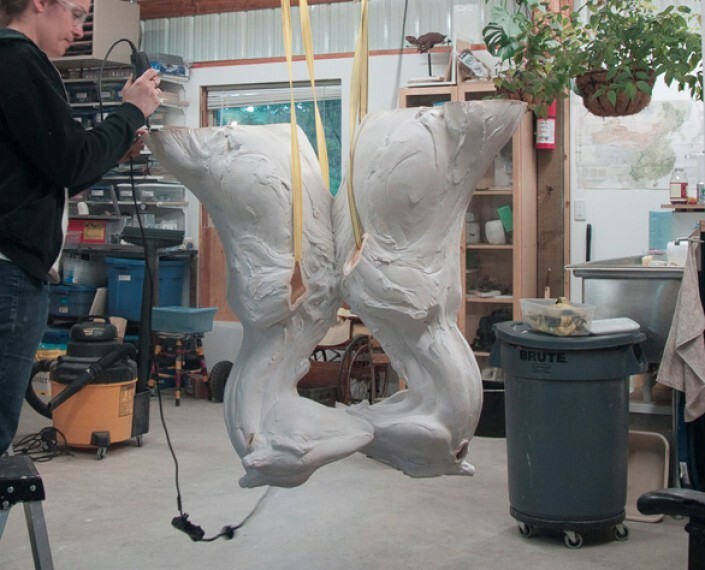 This position allows gravity to help with the positioning of the hips while using epoxy to join the sections. 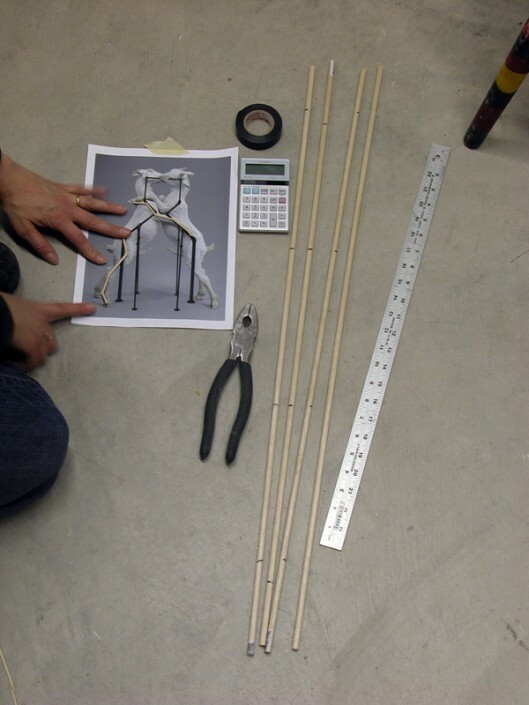 2 x 4's are used to counterbalance the weight of the added section while the epoxy sets. 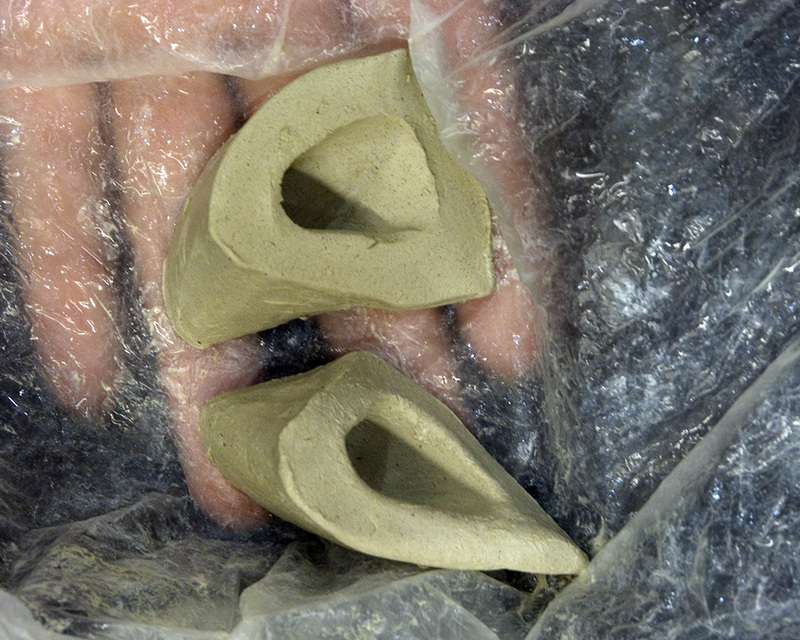 Using a diamond bit, the excess epoxy is removed and chased down 1/8” below the fired surface. 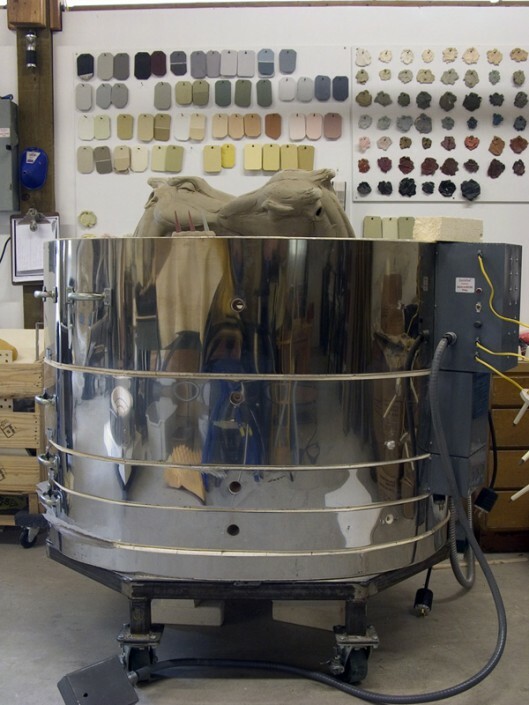 This protects the epoxy from UV exposure. 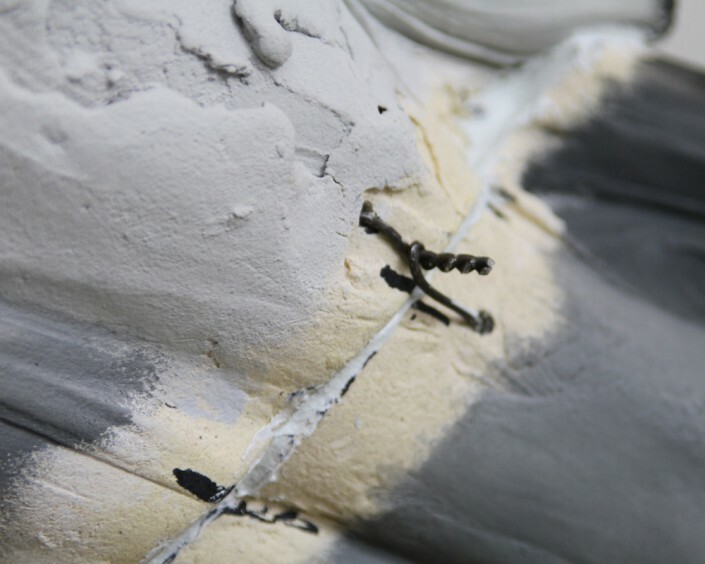 Detail of chased epoxy seam. 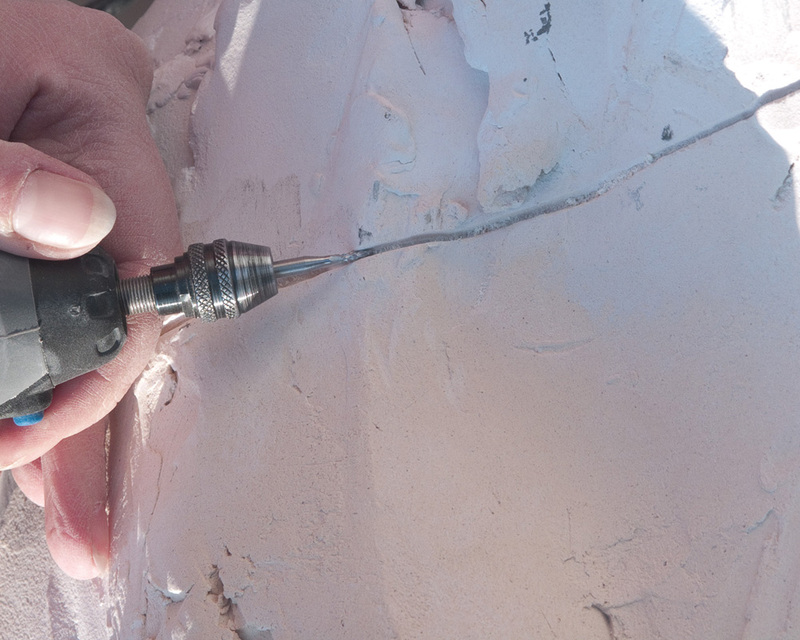 Re-sculpting of the surface across the epoxy seam with a right angle grinder, foredom, and dremels. 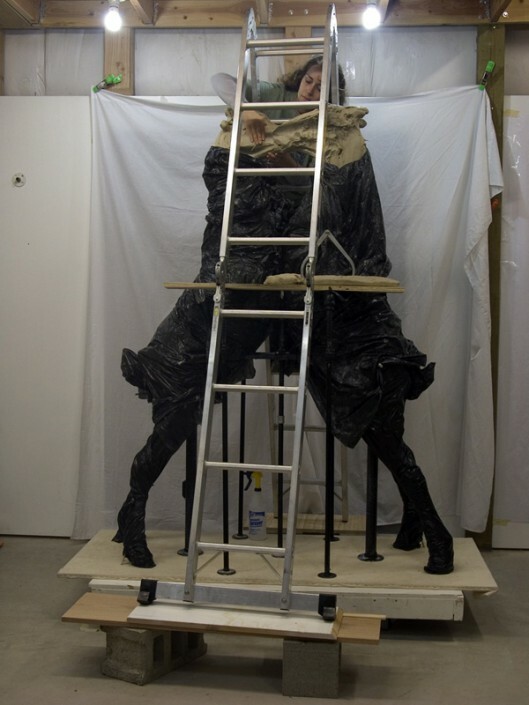 The piece is suspended in position for reattaching the legs. 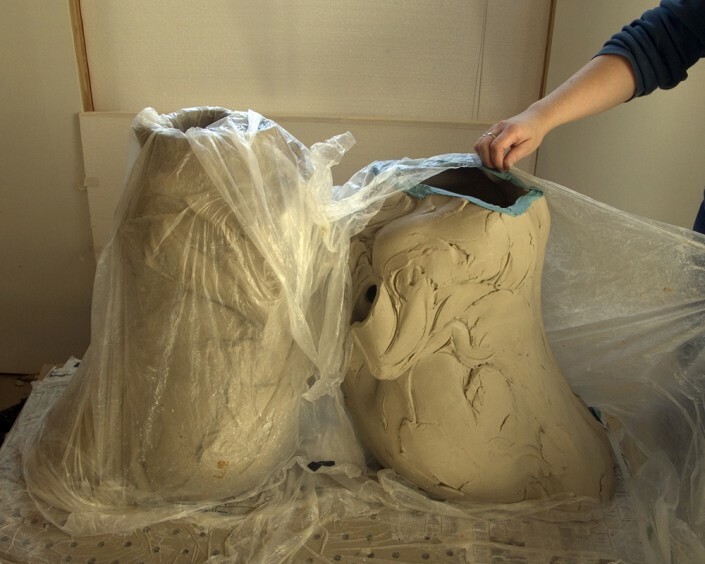 The legs and torsos are painted with the finished patinas before reassembling. 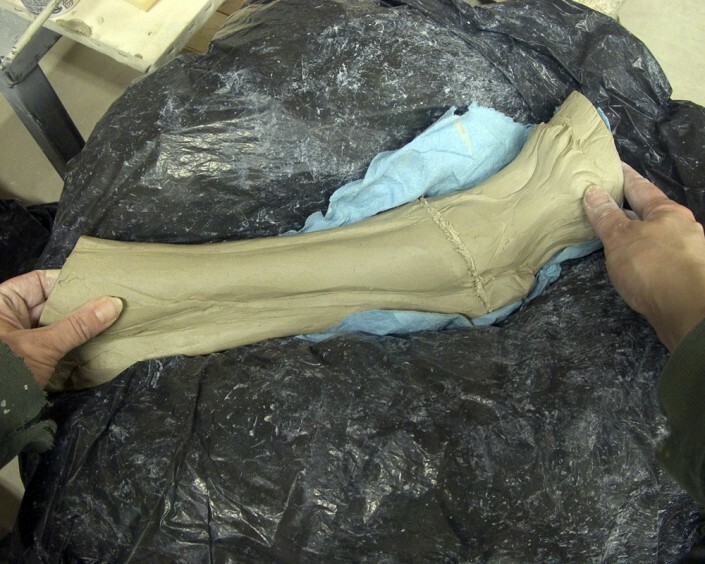 The leg is held up to the piece and registration marks are drawn. 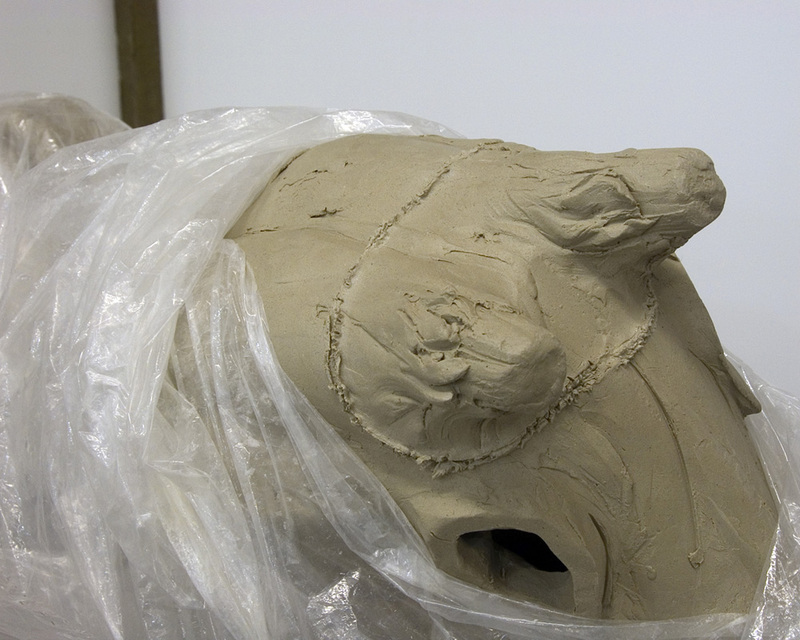 Some warping has occurred so the edges are ground to fit. 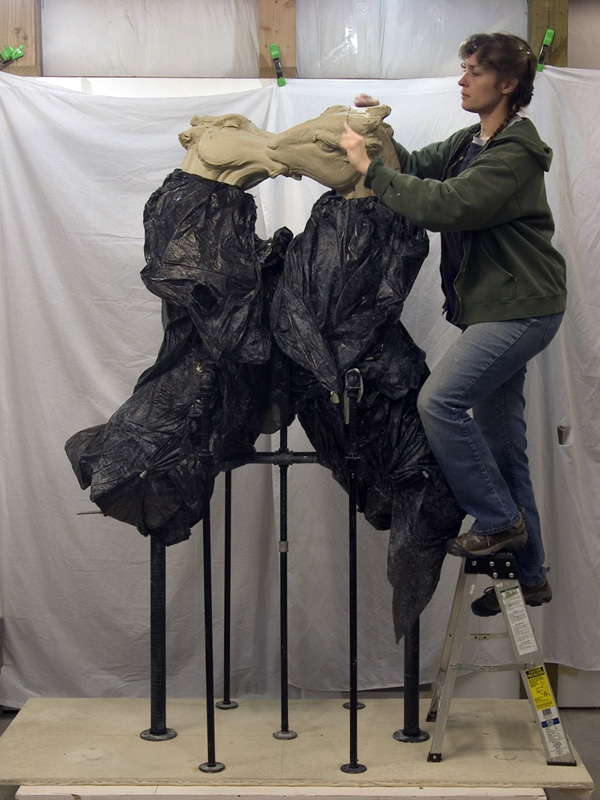 The areas that are not being worked on are wrapped to keep them clean and free from the debris from grinding. 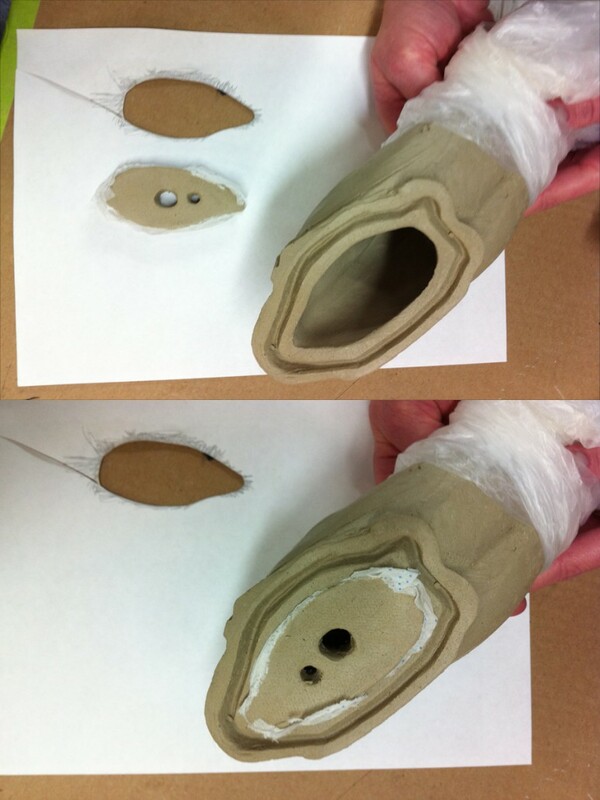 Two-part epoxy is measured by volume. 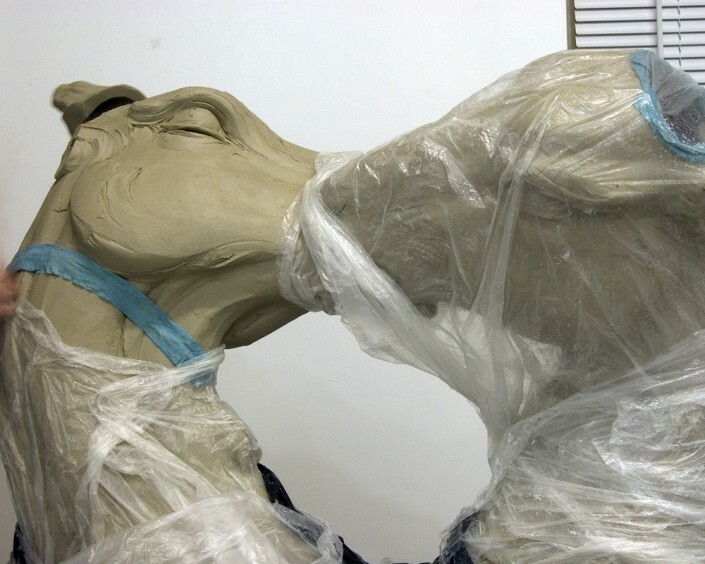 A slow curing, waterproof, and UV resistant epoxy is chosen for archival purposes. 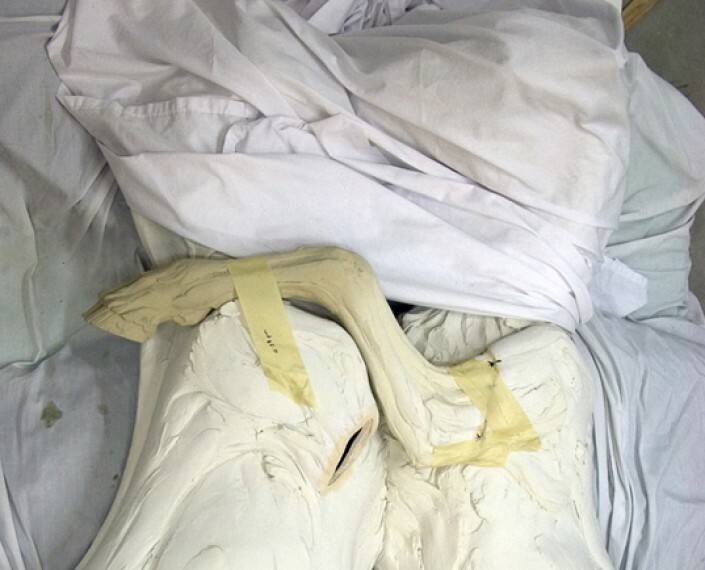 As the epoxy is curing, the leg is held in place with wire and tape. Detail of seam held together with wire while the epoxy is curing over a 12 hour period. 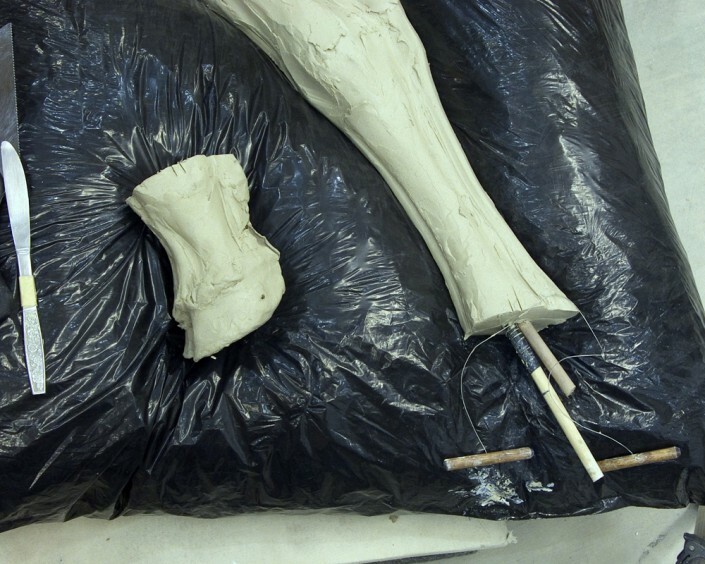 After attaching the first leg , each leg was placed and taped in its approximate position and then taped flat to the ground. 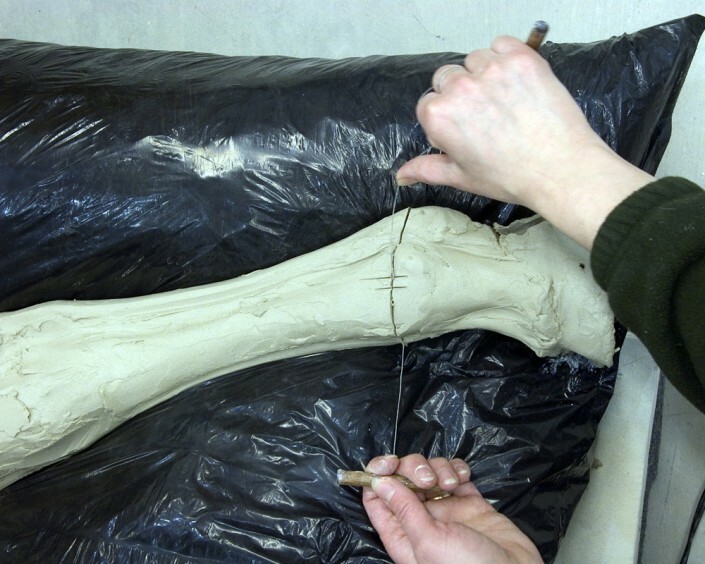 Shims are used to stabilize the position of the leg. Small tiles of different sizes were made out of clay and fired in order to fill the gaps in the seams between the legs and hips. 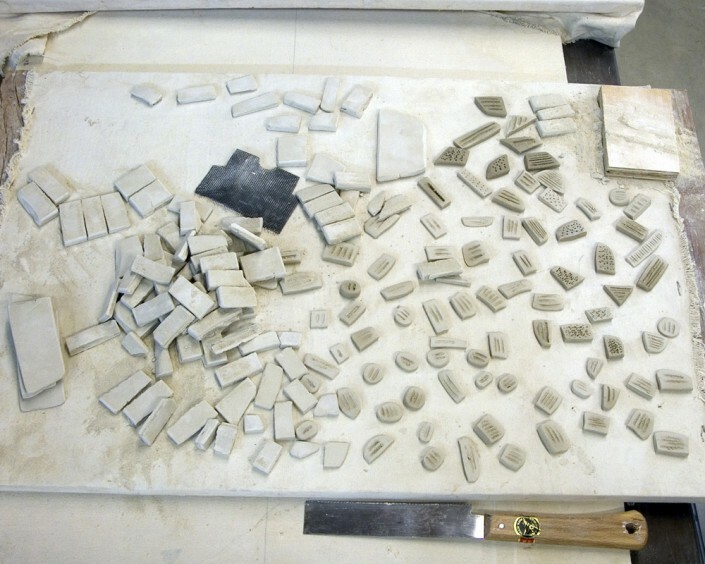 The tiles will be used as clay shims to fill the gaps between the legs and hips. The clay shims are individually glued into place. 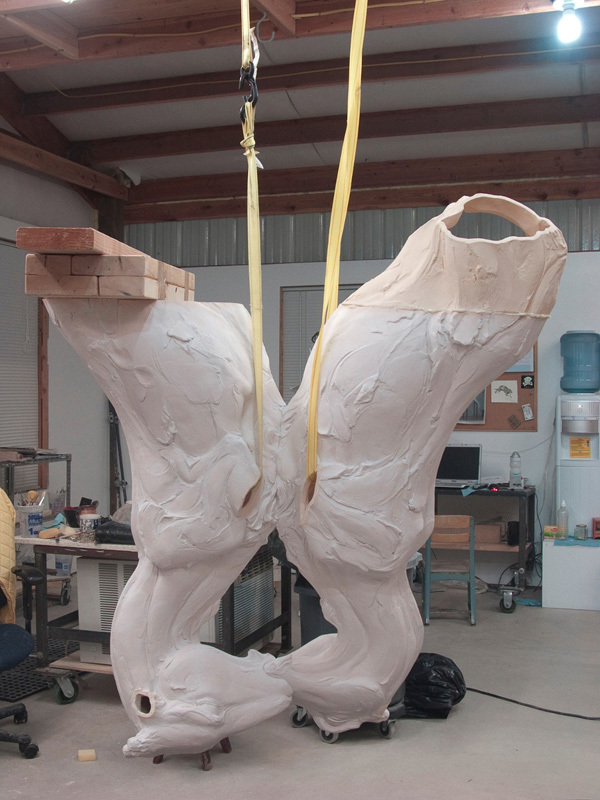 After all of the legs have been glued into position, the remaining gaps are filled with epoxy. 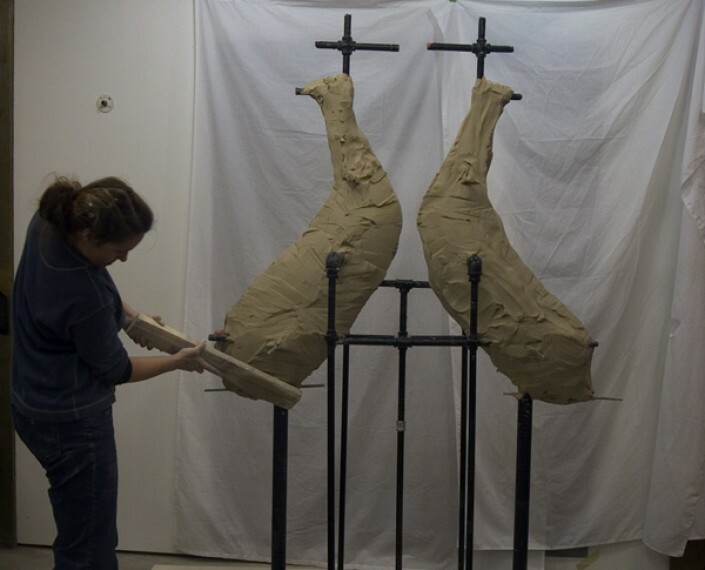 The arms are now being glued into place. 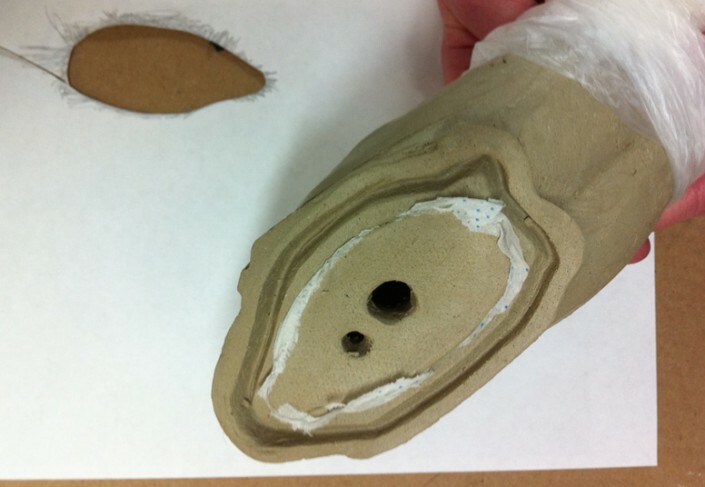 After the epoxy has cured, the excess epoxy is removed, and the seam is resurfaced with diamond bits. 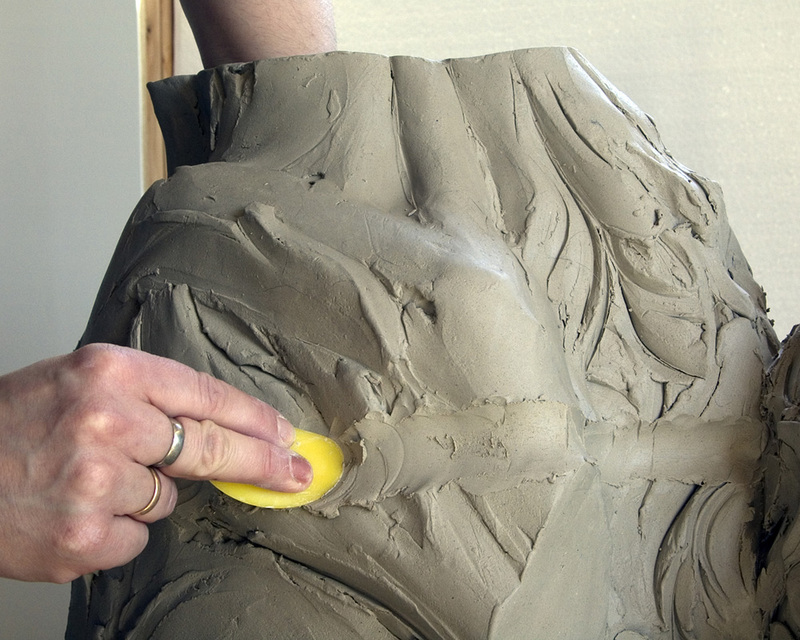 A two-part kneadable filler epoxy paste, Apoxie Sculpt, is used to disguise the seam. 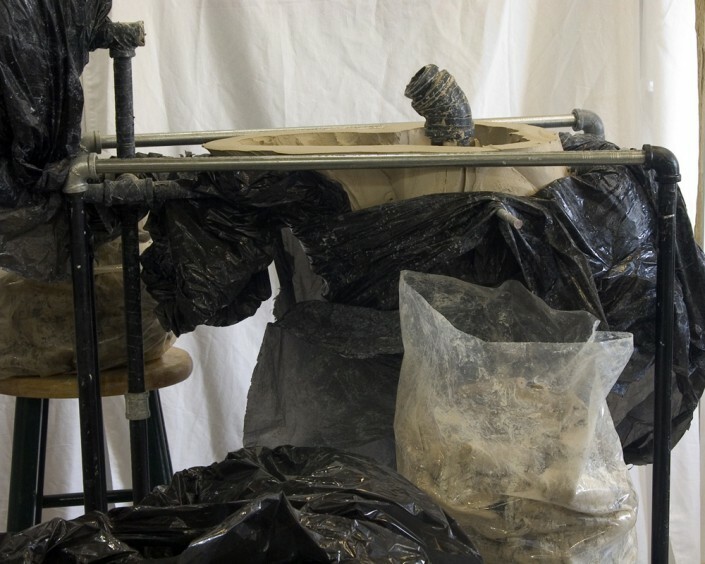 Note: gloves should be worn when mixing these materials. 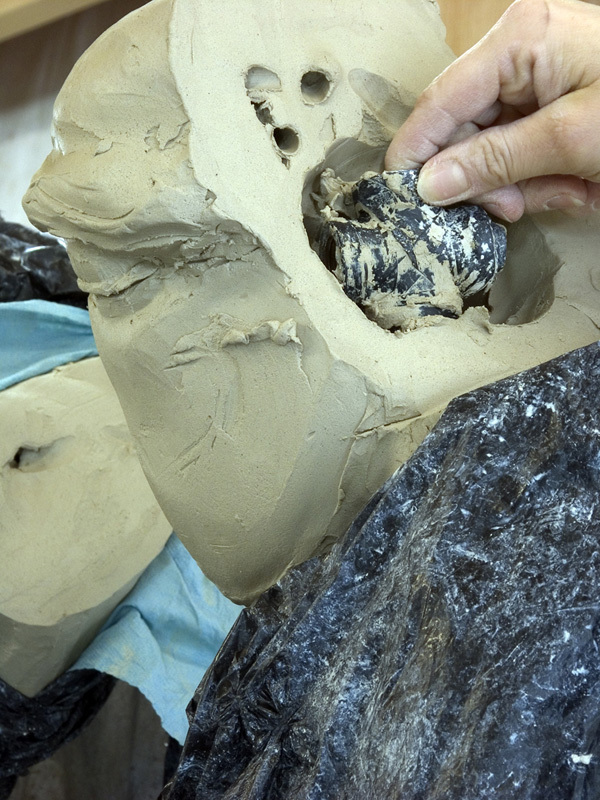 The mixed paste is initially rubbed into the pores of the clay around the seam to insure proper adhesion. The Apoxie sculpt can be manipulated using a little water on the same tools used to create the original clay surface. 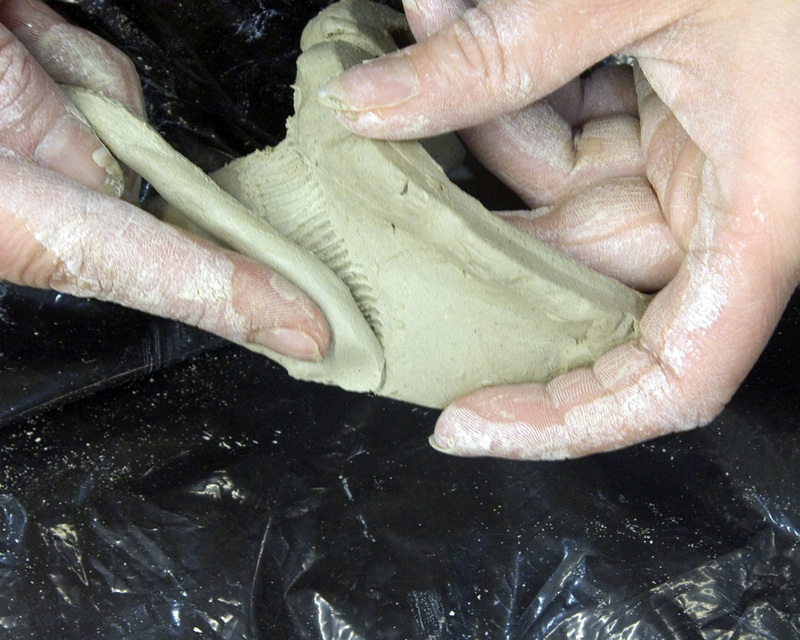 A clay-like porous texture can be created by pressing wet sand paper of different grits into the curing Apoxie Sculpt. 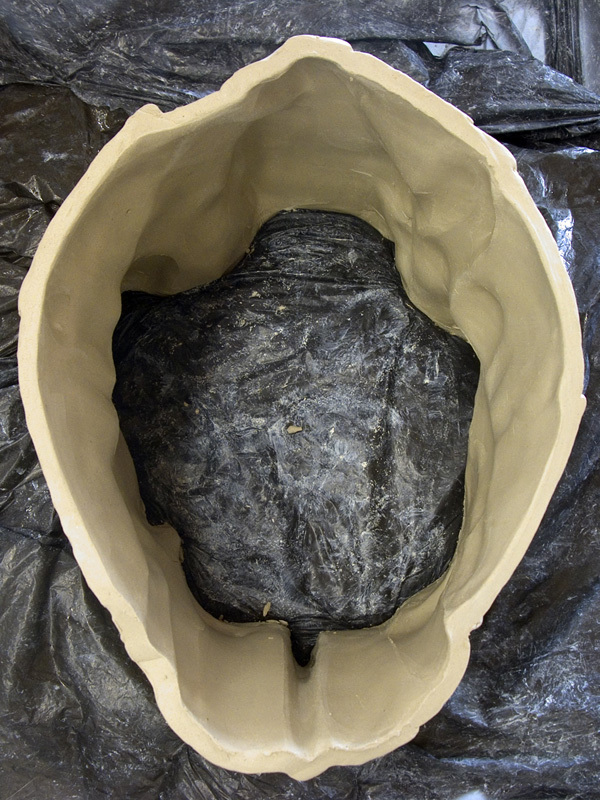 Because the surface is not actually porous, the primer and paint layers are applied in thin coats with a sponge to avoid obscuring the texture. 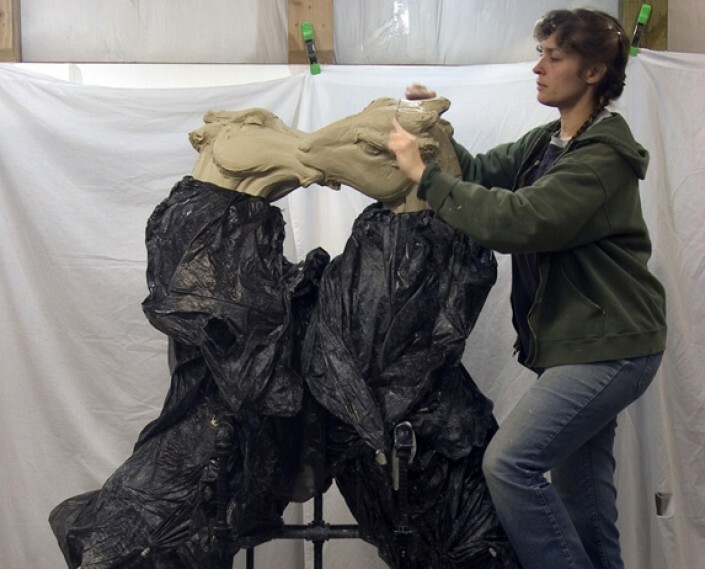 Tinted PC-11 is applied to the bottom of the piece in order to level the sculpture. 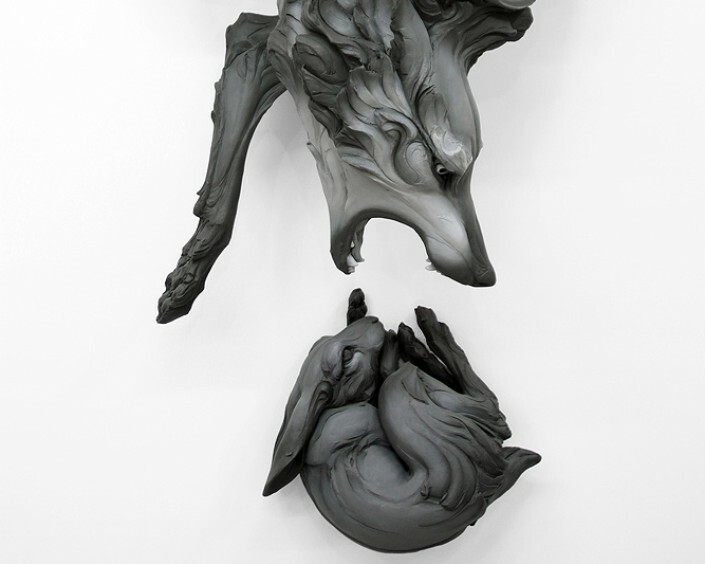 Completed piece installed in the gallery.